Anyway, back to our new place. I think my favorite part of our new digs is the kitchen. The counters, the cabinets, the island, the set-up…I just LOVE LOVE LOVE it (I will share a picture once it’s all set up). Plus, having a new kitchen makes me so much more motivated to cook. Healthy dinners for the win! 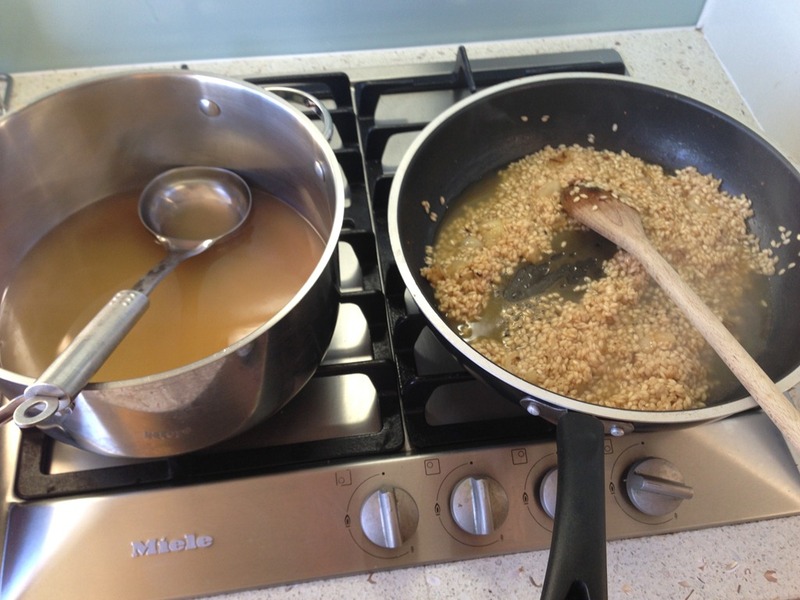 1) Preheat oven to 425 degrees F.
2) Place quinoa and chicken (or vegetable) broth in a saucepan, stir, and put burner on high. Once it begins to boil, lower temperature to a simmer and cover (stirring every few minutes), until it’s thickened and fluffy. (This will take about 15 minutes). Trust me, one cup expands IMMENSLY! 3) While the quinoa cooks, chop your vegetables. 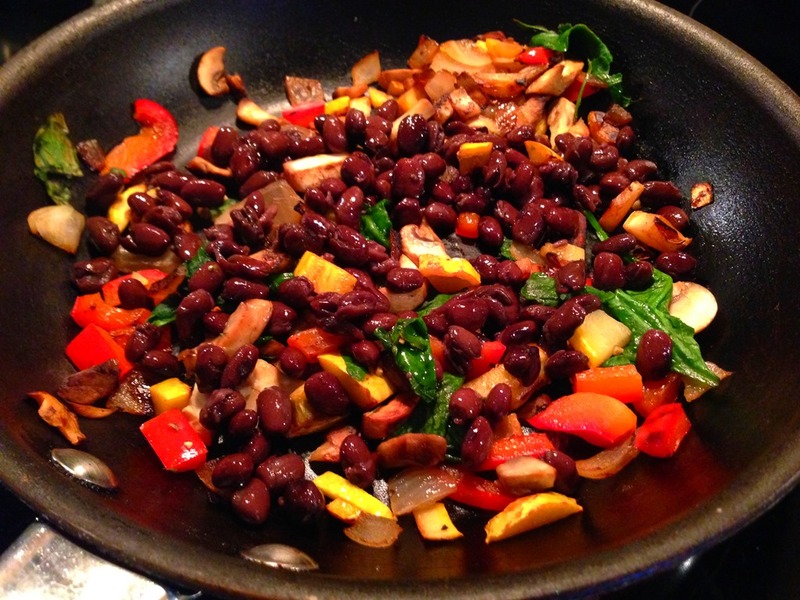 I chose onions, squash, mushrooms, red pepper and spinach, and at the last minute I added some black beans in, too. 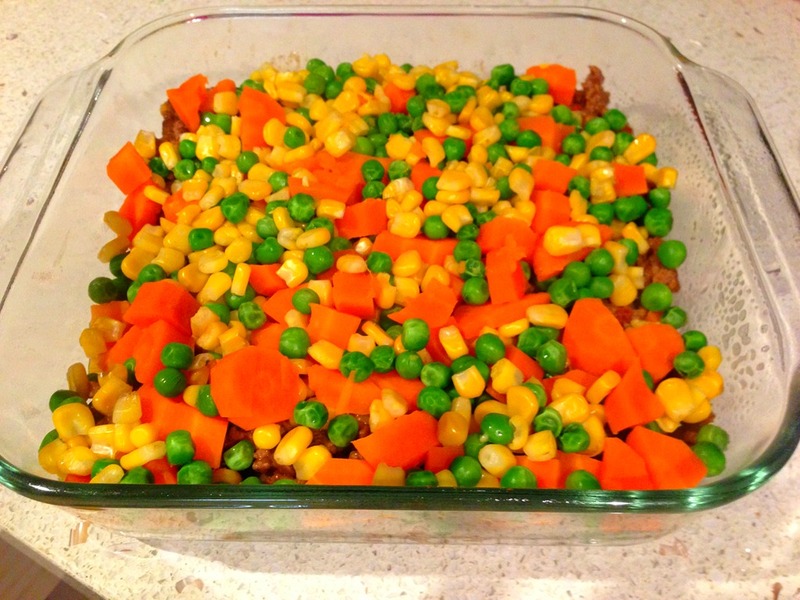 The beauty of this dish is you can honestly use any vegetables in your fridge. 4) Stir-fry these on the stove until cooked thoroughly (using spices of your choice), and add the spinach in at the last minute. 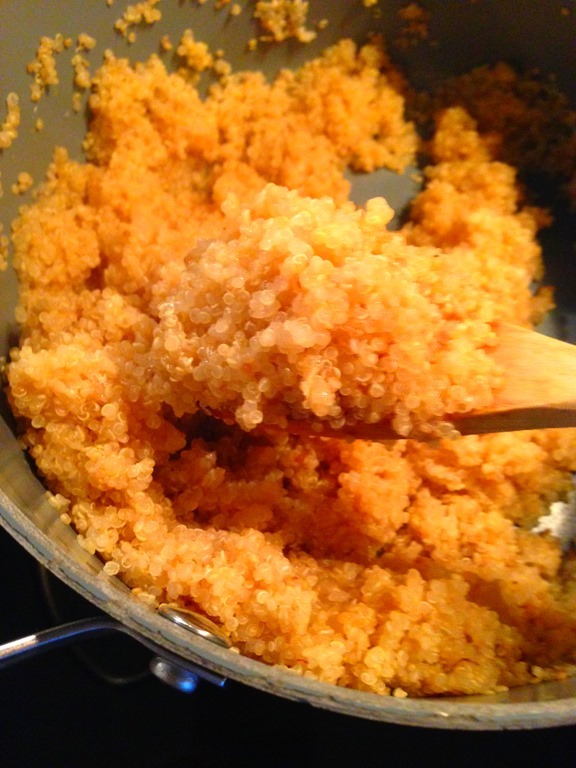 Once cooked, set aside until the quinoa is finished. 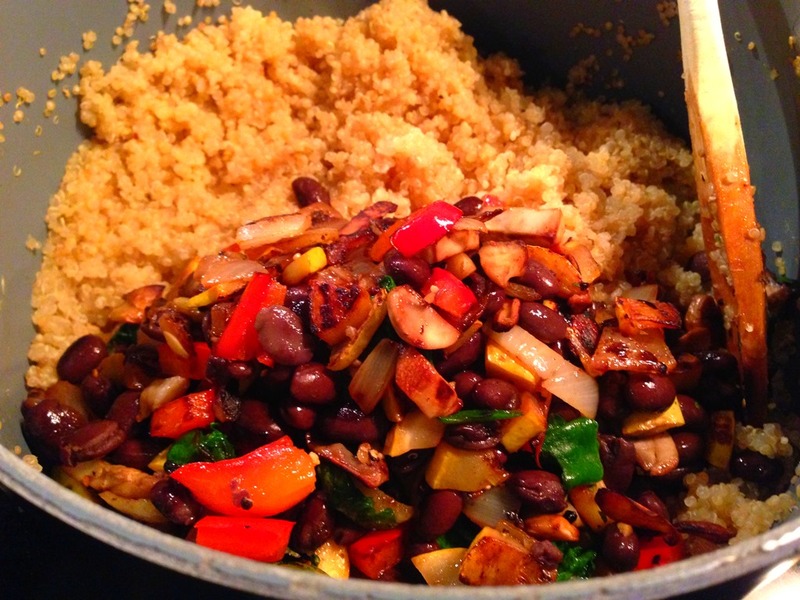 5) Once the quinoa has finished cooking, add the vegetables in. Voila, you have your quinoa mix! Have a great rest of your week and weekend, friends. Happy almost fall! Do you cook with quinoa? If so, what’s your favorite way to eat it? Any one else move in September? Gahhhh moving is the worst! Anyway, this week is what I consider to be one of the most tiring weeks of the year as a student: “study week.” I am trying to stay positive, rested, energized and hydrated. So far, so good! However, in the midst of studying for four finals, there is very little time to cook. At first, I was unsure if I’d even be able to make one or two decent dinners, but it just so happens that a little box I received in the mail a few week ago would save my life on weeks like this! Last month, I was contacted by Alex at Little Box of Yum, an Australian-owned company, and I was immediately intrigued. Little Box of Yum is just what it sounds like: A little box of yum delivered to your door each month. I’m going to do an entire post devoted to the box I received, but essentially how it works is that you subscribe for what’s called a ‘Discovery Box’ which contains a variety of diverse food items each month. Each month you’ll receive a new box with new items, and included along with your box of items is a Discovery Booklet, which helps you learn about the food and the people who make it. Little Box of Yum also features recipes throughout the month on their website and Facebook page using the food in the boxes in order to give you ideas and inspire you to use the products. It’s perfect for busy people who don’t always have the time to explore markets or shops for new products. 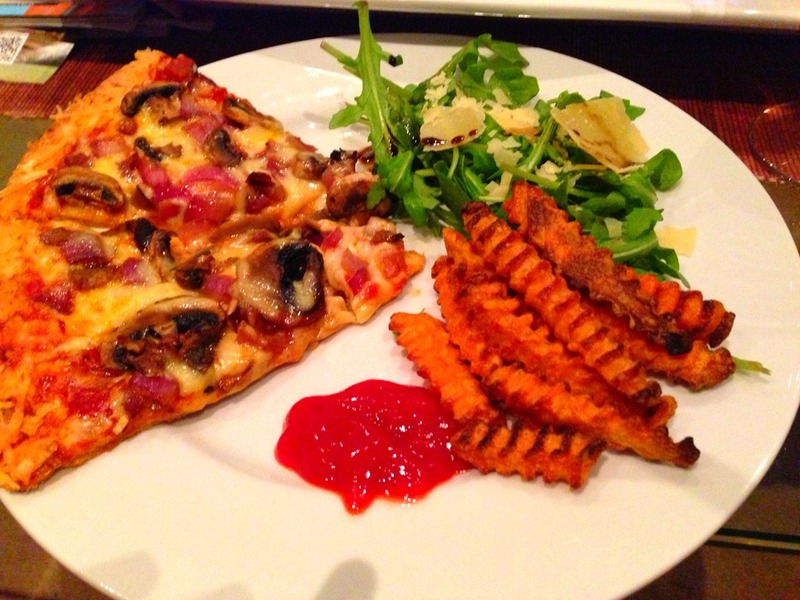 Plus, I’ve found that it’s perfect for making a simple meal feel like a gourmet one! 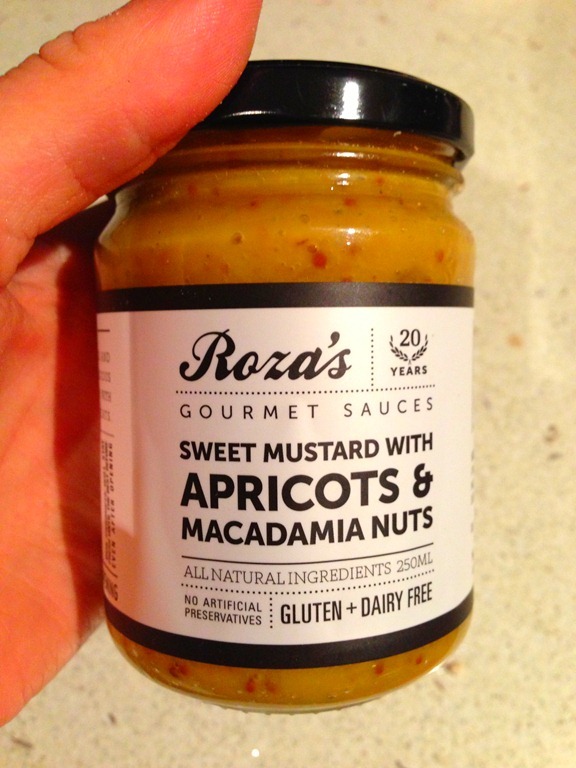 The first product I tried from my box was a sauce called ‘Roza’s Sweet Mustard with Apricots & Macadamia Nuts’. 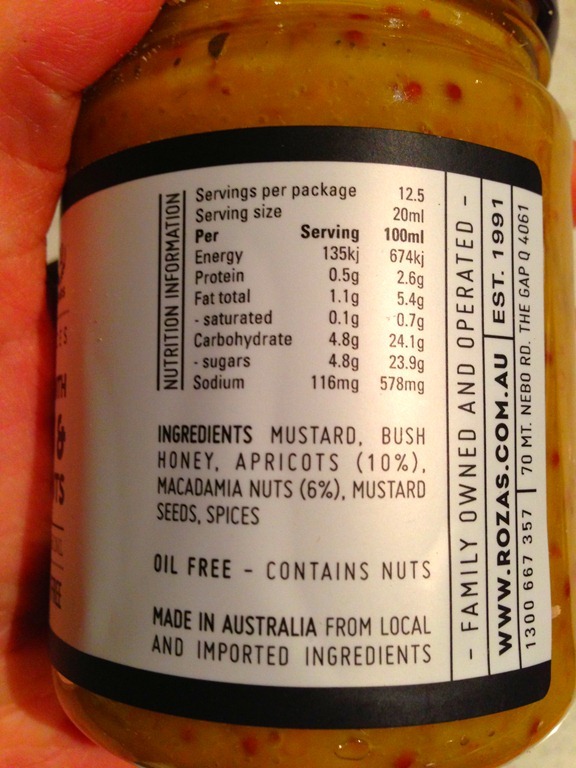 I love mustard, and I adore apricots and macadamia nuts so I had high hopes for this. 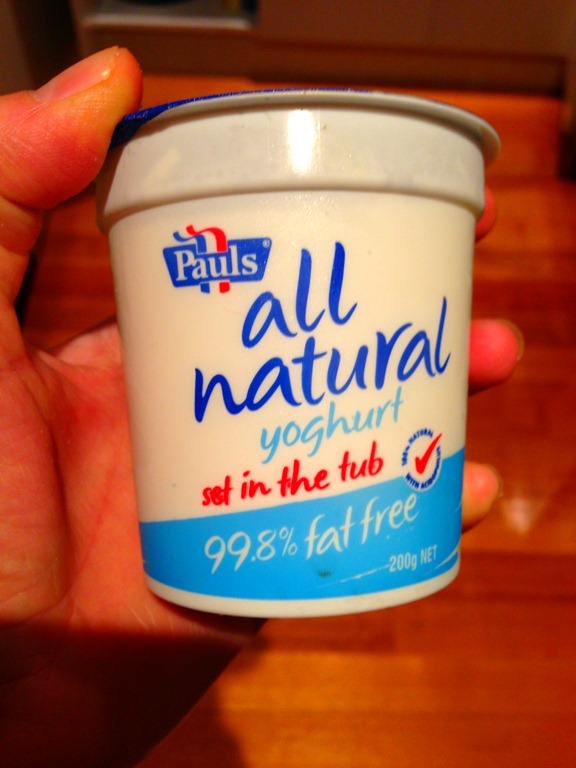 The ingredient list is minimal and it’s gluten/dairy free too, which is a plus for people with those intolerances! I used the Discovery Booklet for some inspiration, and decided to make homemade chicken fingers, using the mustard as a dipping sauce. All I had to do was combine the mustard sauce with two spoonful’s of natural yoghurt. That’s it! So simple. I don’t know about you but as a child, I loved chicken tenders. Although I still love them, as I’ve gotten older and smarter with my food decisions I prefer to bake my own rather than order a fried option out at a restaurant. 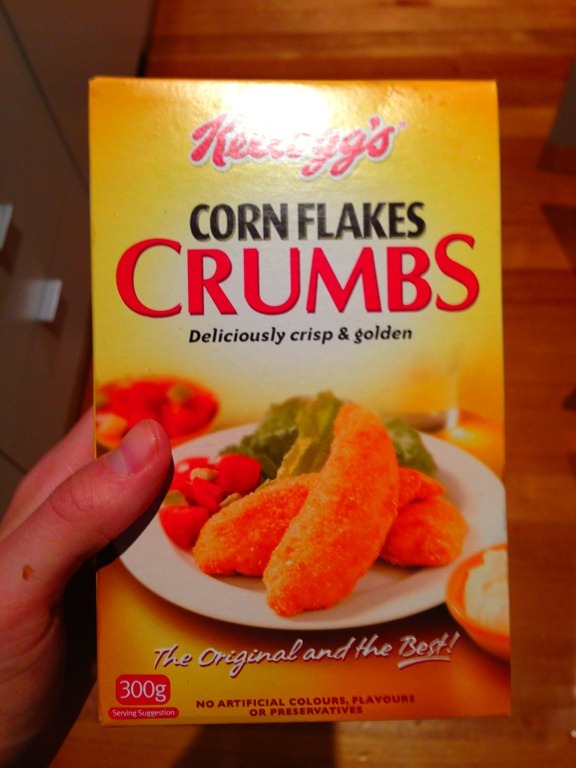 Plus, when there are so many healthy and tasty breading options available at the store, who needs to fry them anyway? I stumbled across this Kellogg’s Cornflake Mixture at the store last week, and snatched it up immediately. You probably don’t know this about me, but cornflakes hold a special place in my heart. You see, for six summers growing up I worked at an ice-cream shop and BBQ barn with some of my closest friends, including Monique! One of the most popular things we served at the BBQ was “cheesy potatoes” which boasted a cornflake topping. So when I saw this at the store, I obviously HAD to have it. Plus, I don’t have a food processor in Australia, so rather than crushing my own cornflakes (which you could easily do to make this topping!) this pre-made mixture made my life during finals 100 times easier. 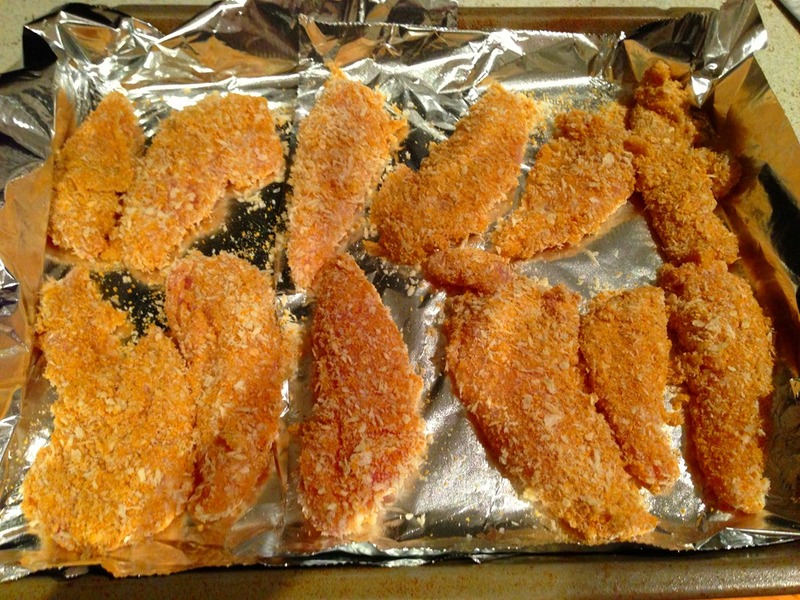 I decided to combine my love of cornflakes with my love of panko crumbs to make some super-crunchy baked chicken tenders, and we loved them. These are simple, delicious, and far-more nutritious than any fast food chain out there! 1) Preheat oven to 425 Fahrenheit (or 218 degrees Celsius). Line baking sheet with tinfoil and spray with cooking spray. Set aside. 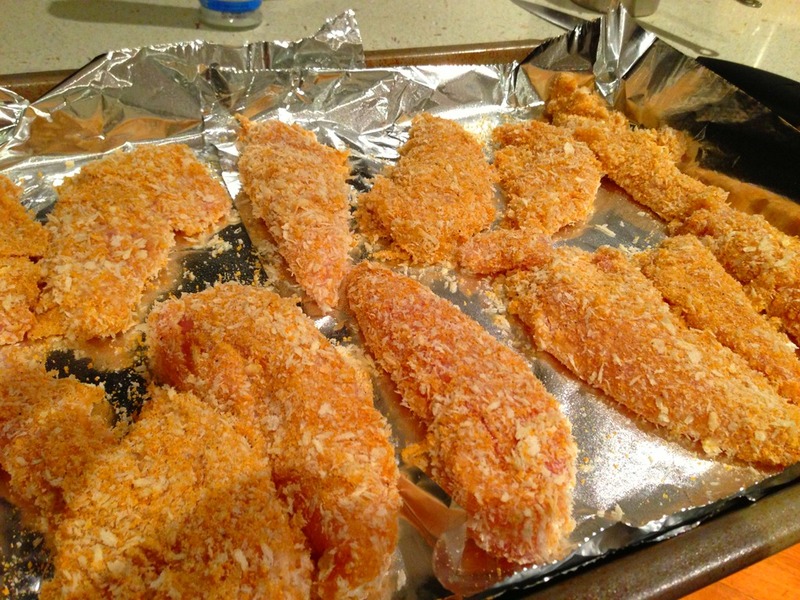 2) Combine panko crumbs, cornflakes mixture, salt and pepper into a shallow mixing bowl. 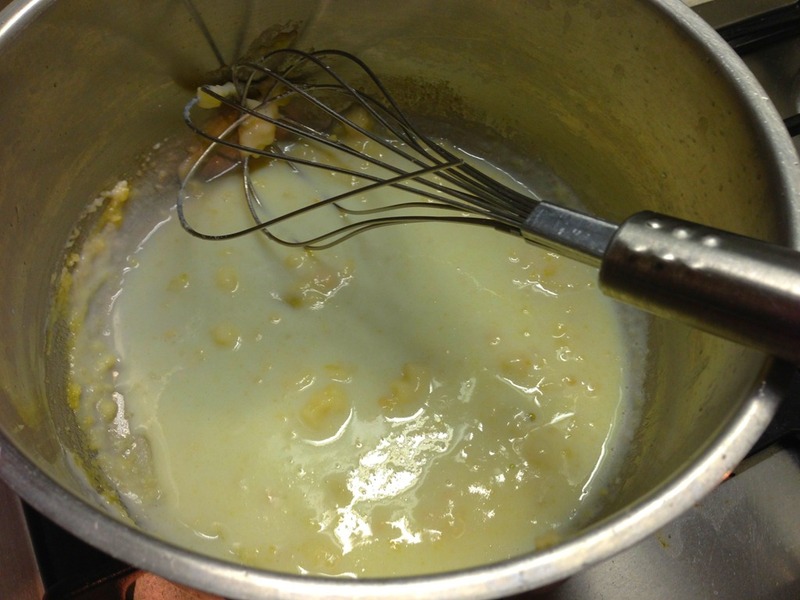 Then place flour in a shallow mixing bowl, and whisk the egg whites in another mixing bowl. Assemble the bowls in a row: First flour, then egg whites, then panko/cornflake mixture. 3) Clean your chicken, and then begin breading it. Roll it in the flour, then the egg whites, then the panko mixture. Then place on baking sheet. Repeat these steps until you’ve covered all of the chicken. 4) Bake in the oven for 12-14 minutes on each side, flipping in-between, until browned. 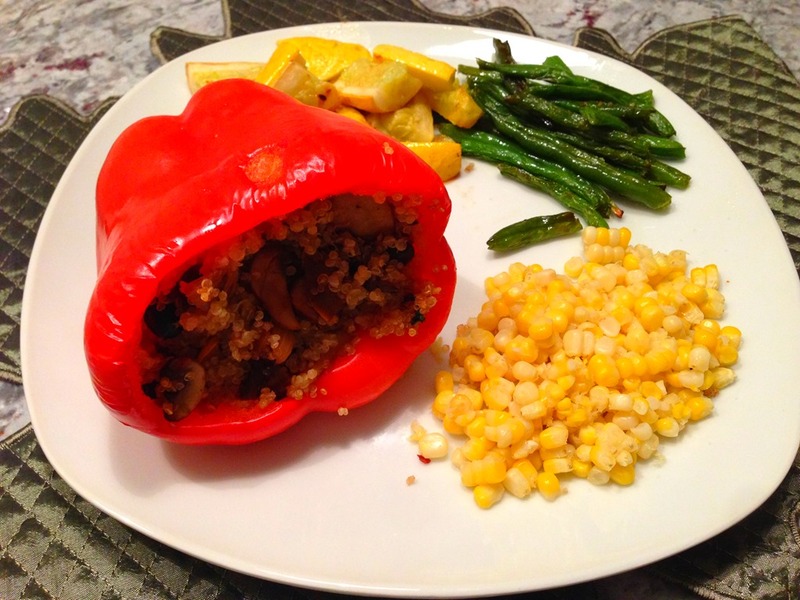 5) Serve along with steamed veggies of your choice. We opted for carrots, along with some fresh corn, too! While we definitely loved the chicken, the Roza’s Sweet Mustard with Apricots & Macadamia Nuts Sauce was easily the hit of the meal. 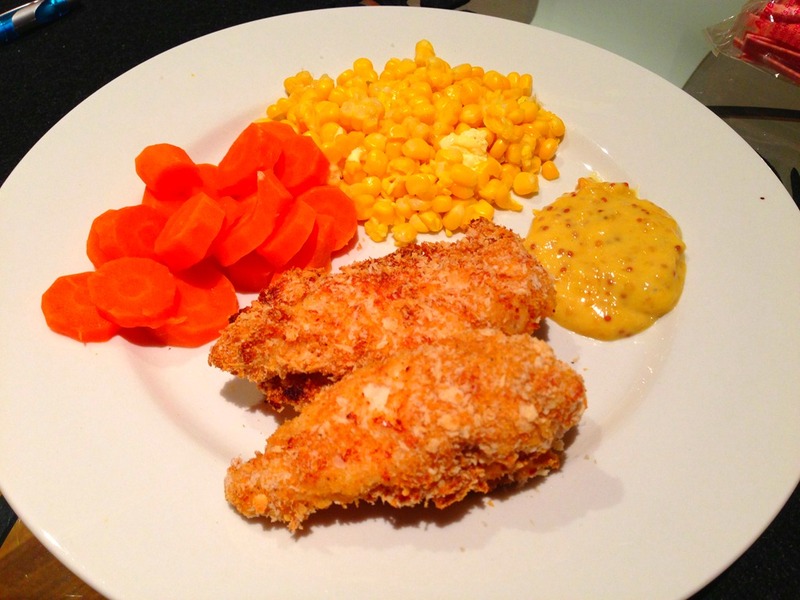 It paired perfectly with the crunchy chicken, and made me feel like I was eating gourmet chicken fingers in mere minutes! 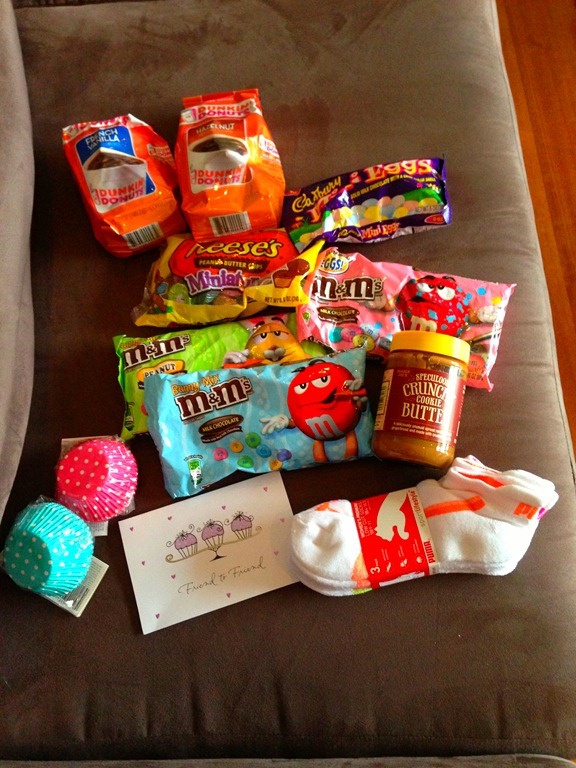 Thank you so much to the folks at Little Box of Yum! 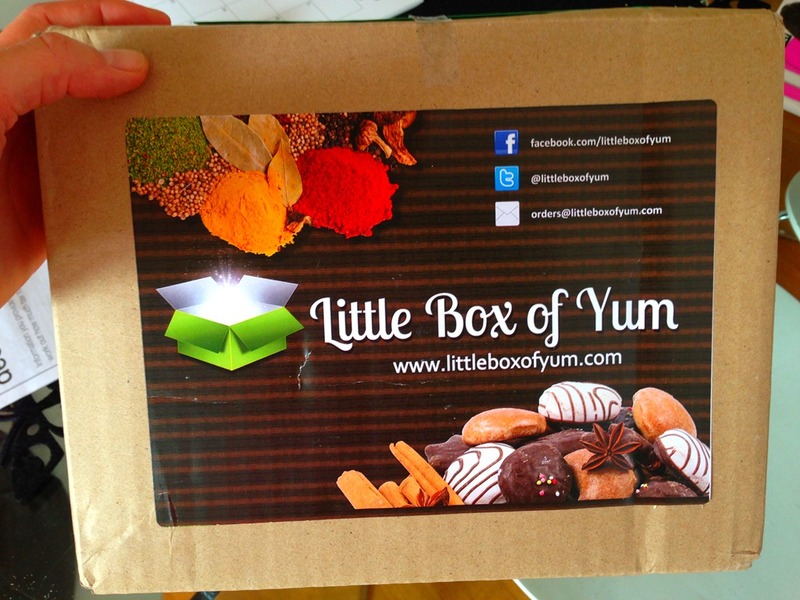 If you’re interested in learning more about Little Box of Yum, visit them here. Well, I’m off to study. Have a good day, friends! Do you subscribe to any food delivery services? If so, what? If not, would you consider? I’m definitely considering subscribing to Little Box of Yum. I think this will help add variety to my meals and force me to try new things! 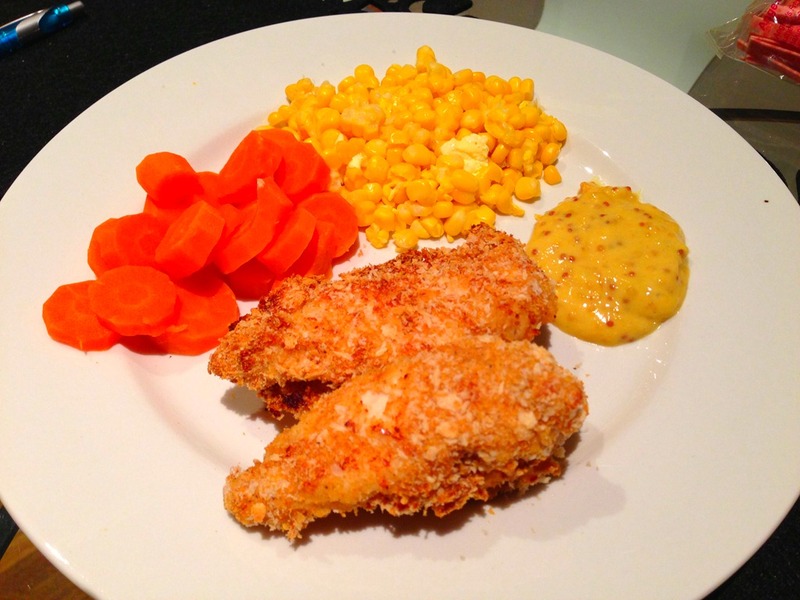 Do you like “healthy” chicken tenders? Hey friends! How’s your weekend going? I’m off to work shortly for my last shift of the weekend, but wanted to share this recipe just in case anyone is in need of an idea for their Sunday-night dinner. 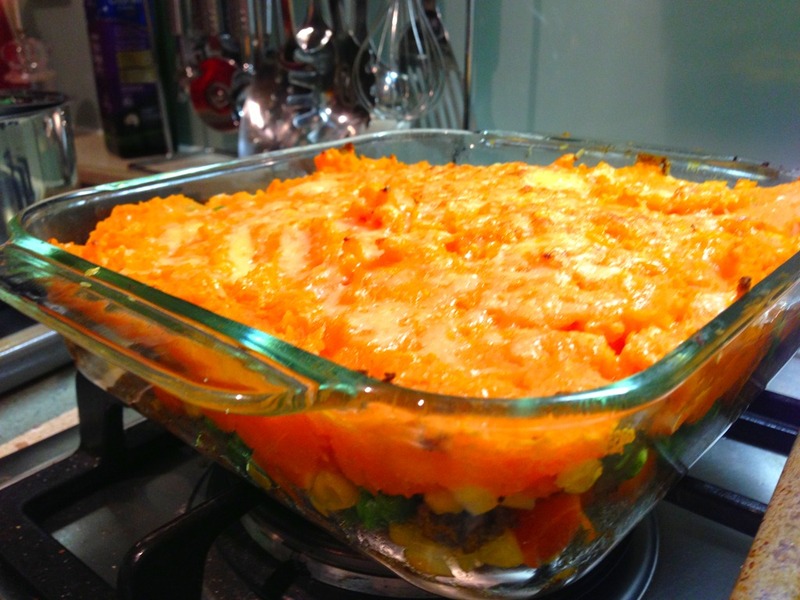 This is the casserole recipe I highlighted on Thursday that I am slightly obsessed with. I ate it for 3 days straight, which saved me A LOT of time on the cooking front last week. 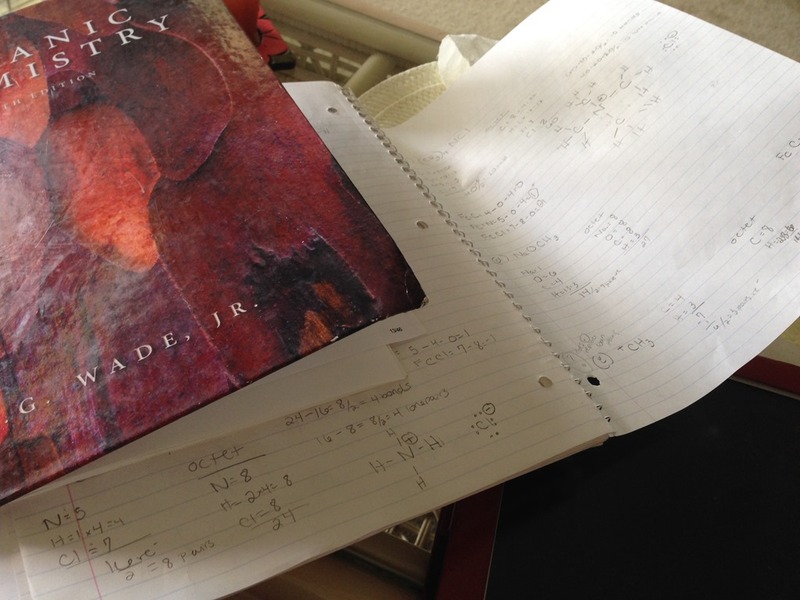 Less cooking time=more study time, which is just what I needed! I’m guessing shepherd’s pie probably isn’t a “new” recipe to you, but I switched this up a bit to include a tex-mex twist on the traditional recipe. 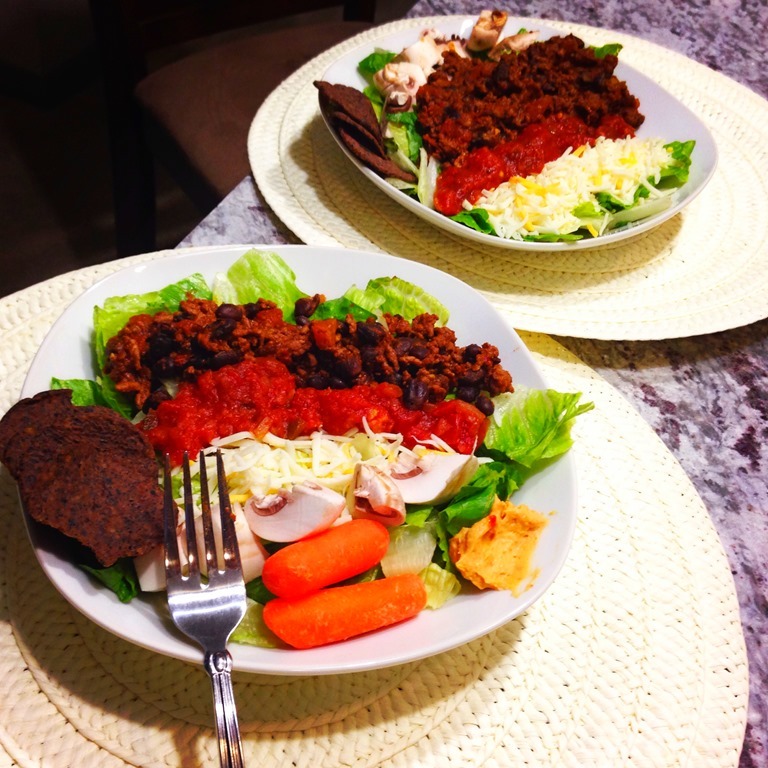 Quite simply, all I did was make taco-seasoned meat (I used a reduced-sodium taco seasoning packet, but Kelly makes a great-sounding, healthier homemade version! 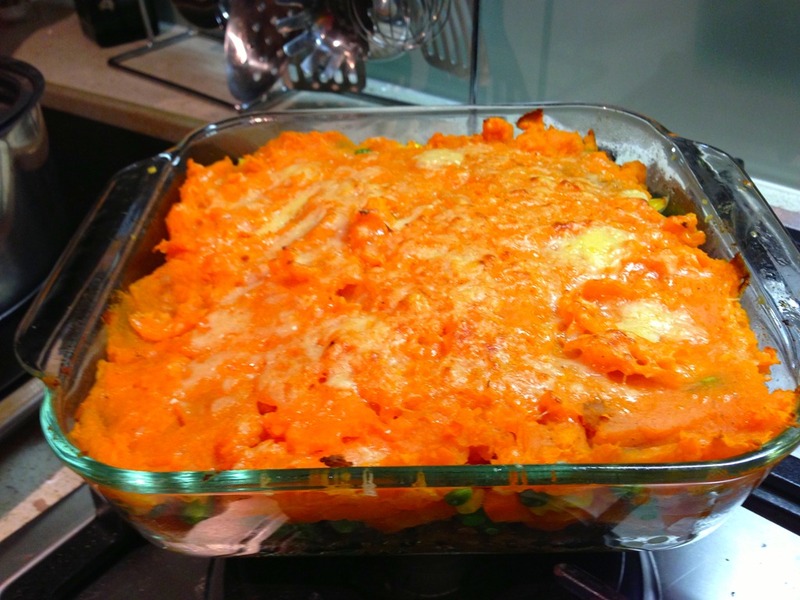 ), added-in steamed carrots, peas and corn, and then topped it off with homemade mashed sweet potatoes. Voila, a casserole was born in under 30 minutes. 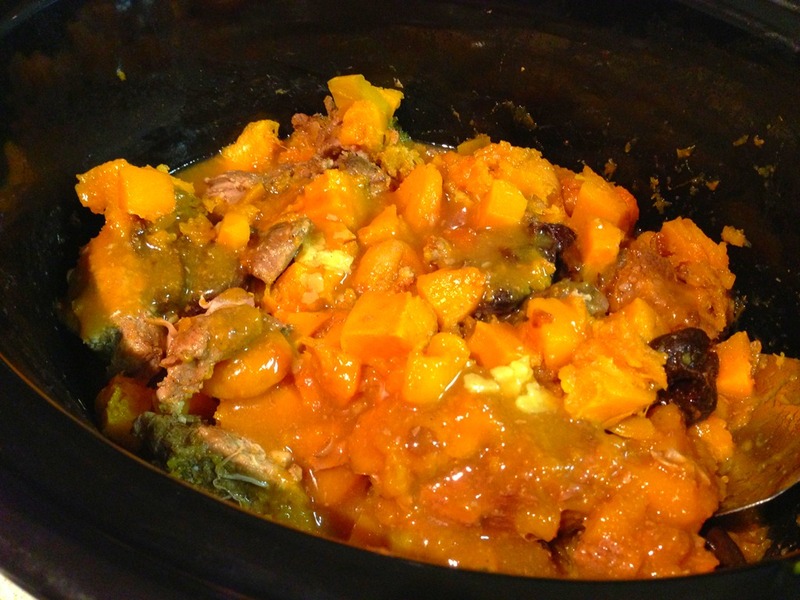 My favorite thing about this casserole was the combination of sweet potatoes and taco meat. Honestly, I now understand why Mexican restaurants sell sweet potato fries. (I really never understood it in the past, I always thought chips and salsa were much more menu-appropriate!) However, the flavors and spices go so well together. I am hooked! 2) I prepared my vegetables first to get that step out of the way. 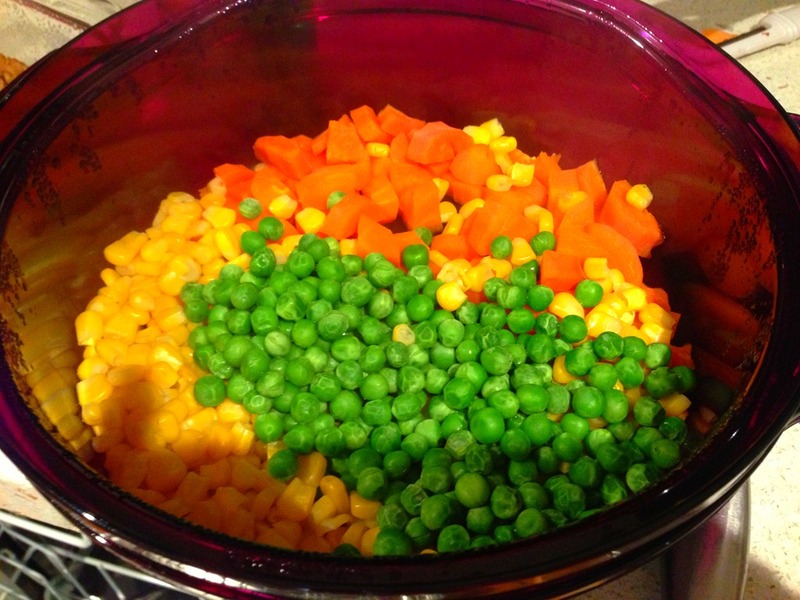 I chopped up about 3 carrots, and then placed the carrots, peas, and corn in the vegetable steamer with a little bit of water. Then I chopped up the sweet potatoes and placed them to the side in a bowl with a little water, and covered it with plastic wrap. Lastly I chopped the 1/2 onion to add it to the taco-meat. 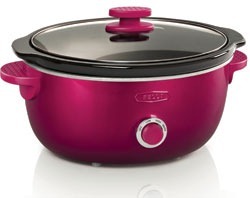 **Side note, how cute is this purple vegetable steamer my Mom got me for Christmas this past year? LOVE!!! 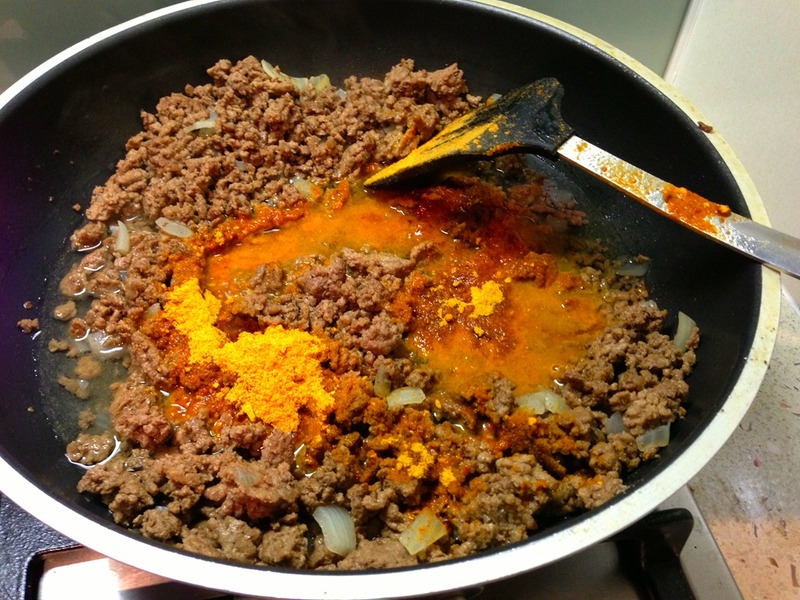 3) Next, using the stovetop, sauté the onion and then prepare your meat according to the taco-seasoning packet. 4) While your meat is cooking, steam the vegetables in the microwave. 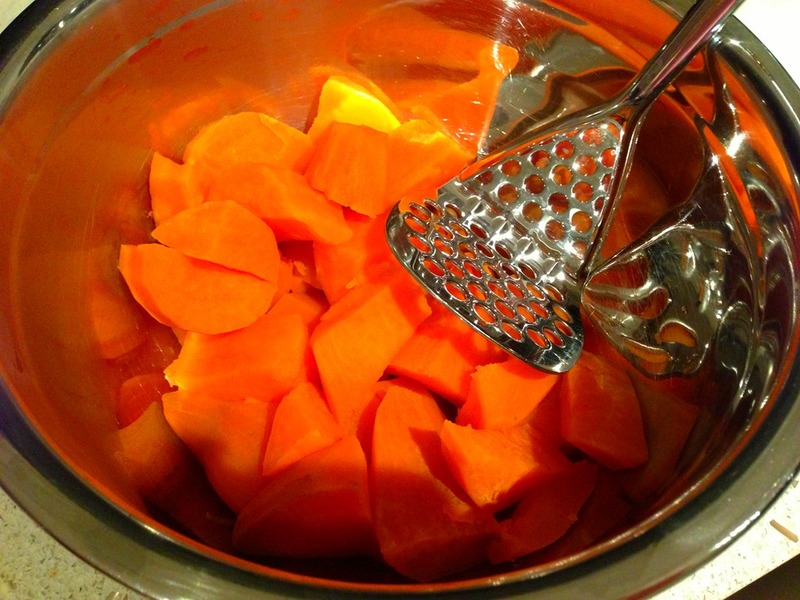 Then, steam the sweet potatoes. 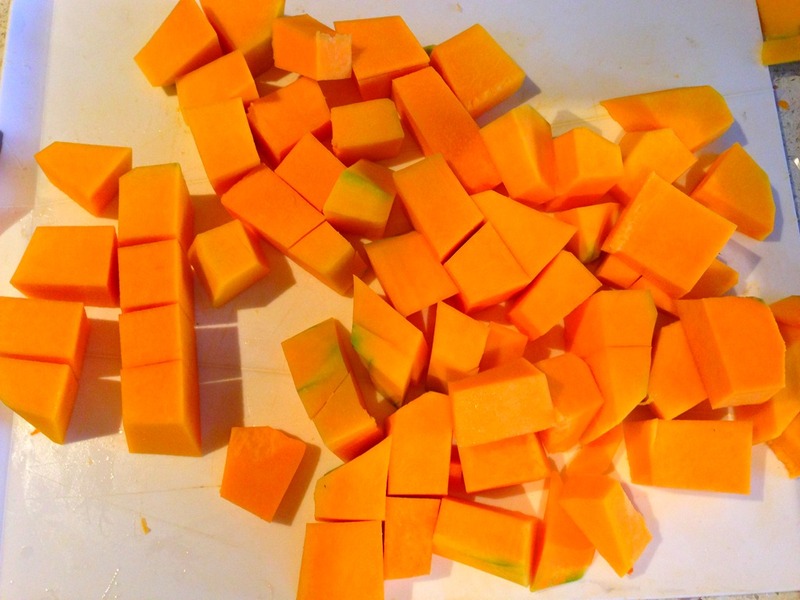 (I always steam my sweet potatoes by chopping them up, adding a little bit of water, covering them with plastic wrap and placing them in the microwave because I love how easy it is). Since I used about 3 large sweet potatoes, I cooked these on high-power for about 5-6 minutes. Once they seemed soft enough, I mashed them in a large mixing bowl, and added a bit of butter and cinnamon. 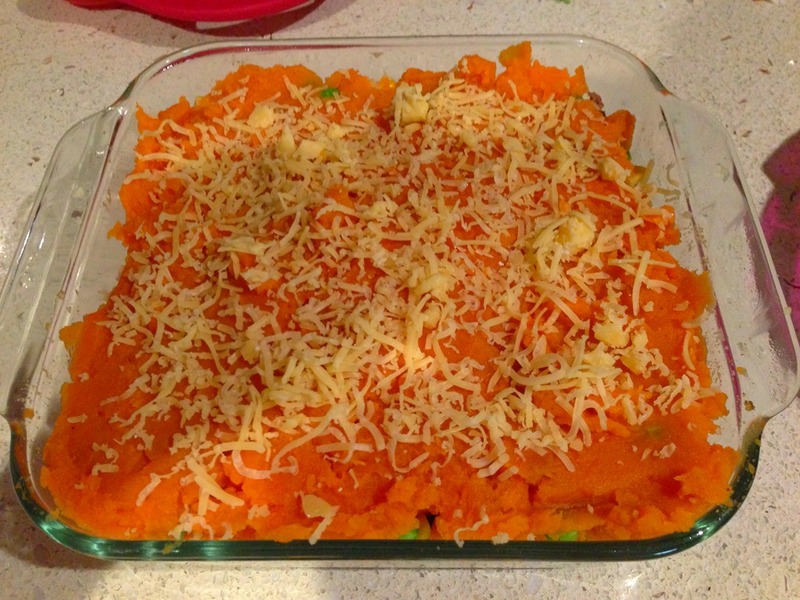 5) Finally, I layered the meat, the vegetables, and the sweet potatoes into the casserole dish, added shredded cheese to the top (Thanks to Brandon for shredding it! ), and cooked it for about 15 minutes, or until slightly browned. This was delicious, and it lasted for days! I’ll be making this again soon, I’m sure of it. 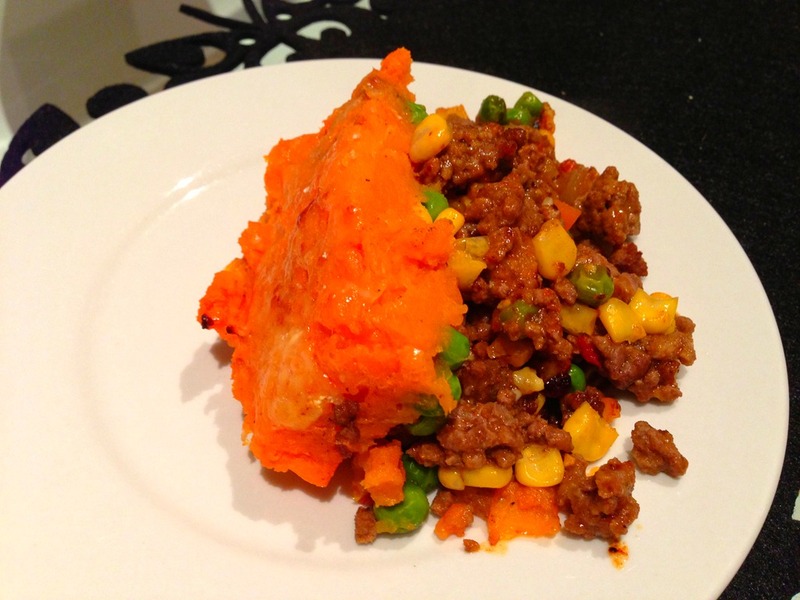 Are you a shepherd’s pie fan? I am, but as I’ve grown older I much prefer it with sweet potatoes! Ever order sweet potato fries at Mexican restaurants? Hey friends and happy Wednesday! Is the week flying by or is it just me? 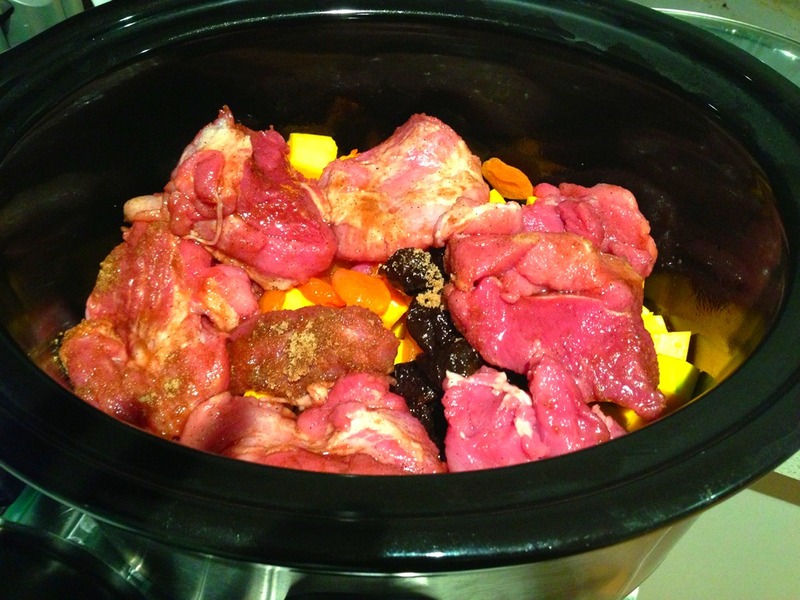 I am losing track of the days, but that’s okay since it means we are that much closer to the weekend : – ) It’s dinnertime here in Australia, which made me realize that I still hadn’t posted the crock-pot recipe I mentioned in a post last week. This recipe originated from my Mom’s recipe book (I’m not positive where she got it from but it sure is a good one! 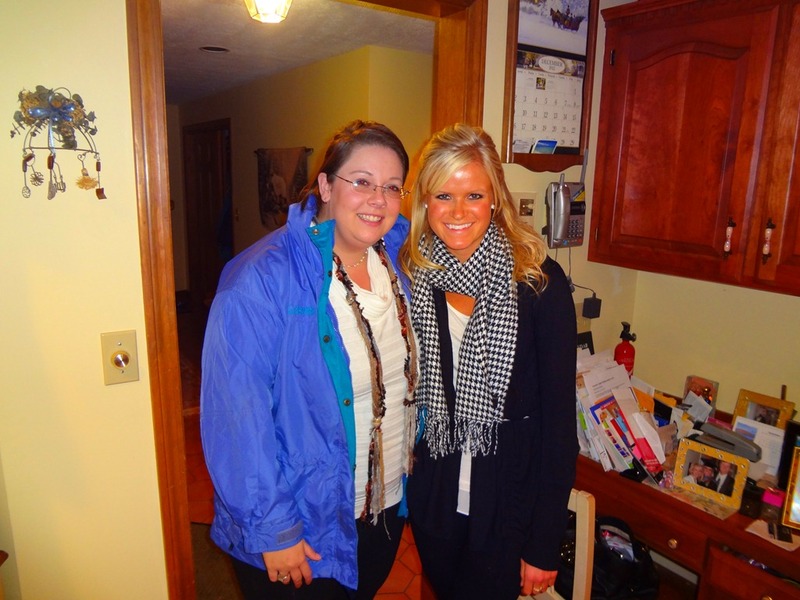 ), and since she knows my love of crock-pot meals, she always shares her recipes with me. This particular recipe was quite a hit when she made it for my grandparents, so she photocopied it for me and I’ve just been waiting for the right time to make it! Who has time to stand around waiting for a meal in the oven for hours upon end? I don’t think many of us! I love the flexibility of this machine- just throw your ingredients in the crock-pot in the morning, set it to low, and let it cook all day. Then your dinner is ready when you walk in the door! 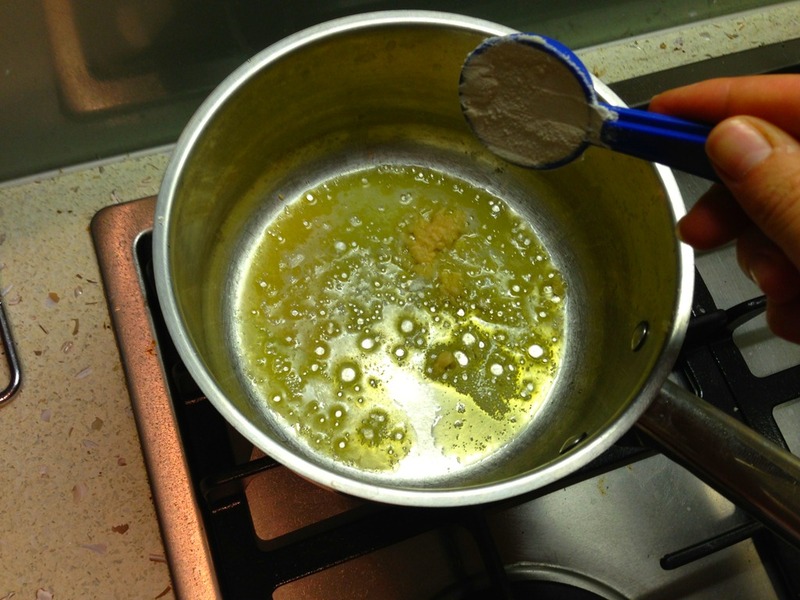 2) Easy clean-up: One-pot clean up? Yes please, I’ll do the dishes tonight. 3) Leftovers, leftovers, leftovers: I love having leftovers for lunches all week. Plus, as the meal sits, the flavors tend to intensify. Yum! 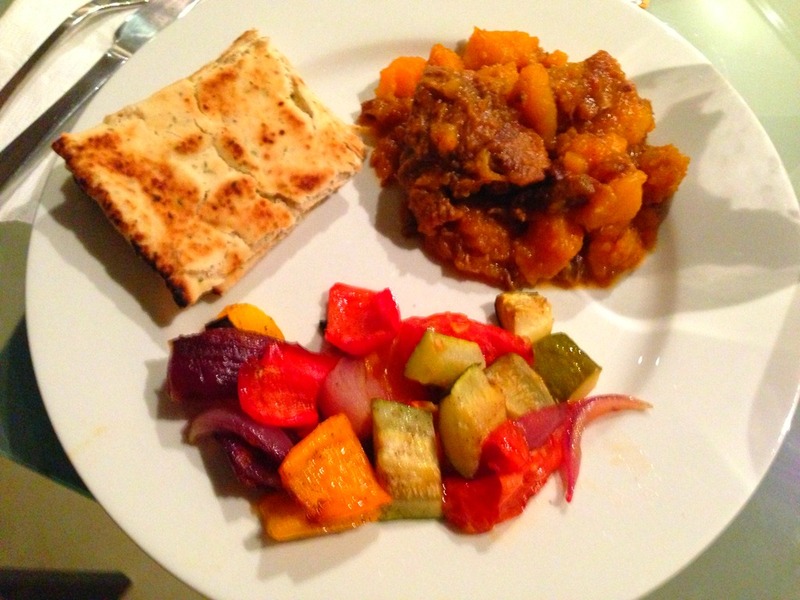 4) The aroma it creates: Coming home to the smell of a delicious simmering dinner just makes me smile. Plus, your guests will get even hungrier once they walk through the door! Anyway, back to this recipe. I’ve been wanting to share this because it’s super simple to prepare and definitely do-able for any dinner party. Plus, it will feed quite a few people. This fed five active and hungry girls, and I had so much left over it could have easily served at least four more! 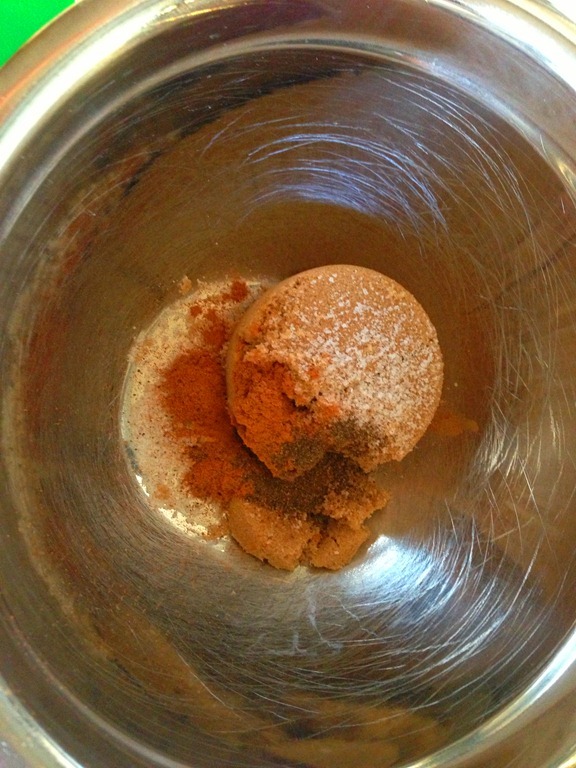 2) Combine the brown sugar, ginger, salt, cinnamon, and black pepper in a small mixing bowl, and rub the pork evenly with the mixture. 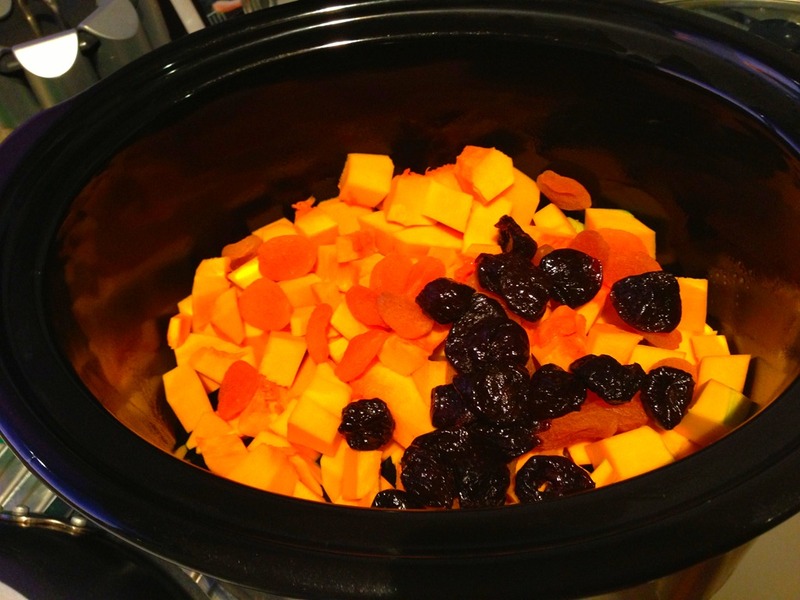 3) Place the pork in the crock-pot and arrange the dried apricots, dried prunes(or plums), and butternut squash around the pork. Then add the water. 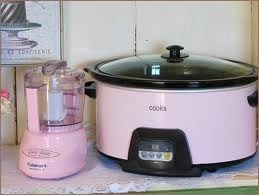 4) Cover the crockpot and cook on high for 1 hour. 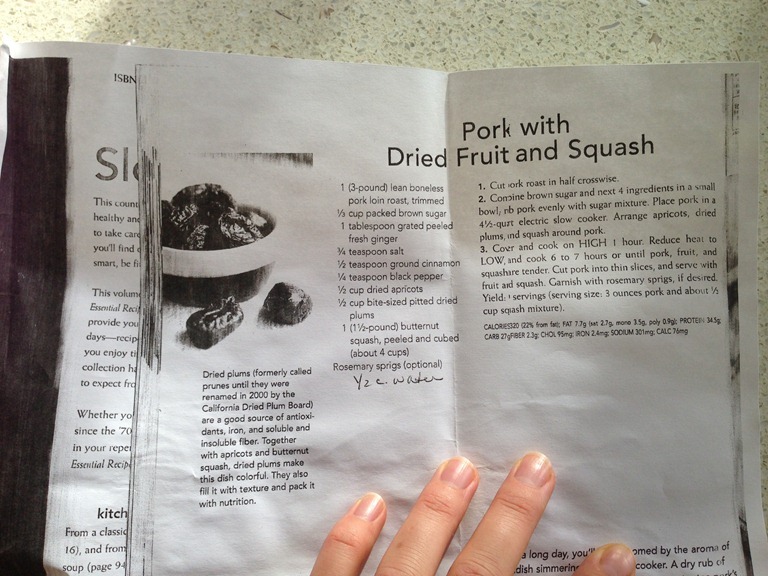 Then reduce the heat to low and cook it for about 6-7 hours, until the pork, fruit, and squash are all tender. Serve and enjoy! 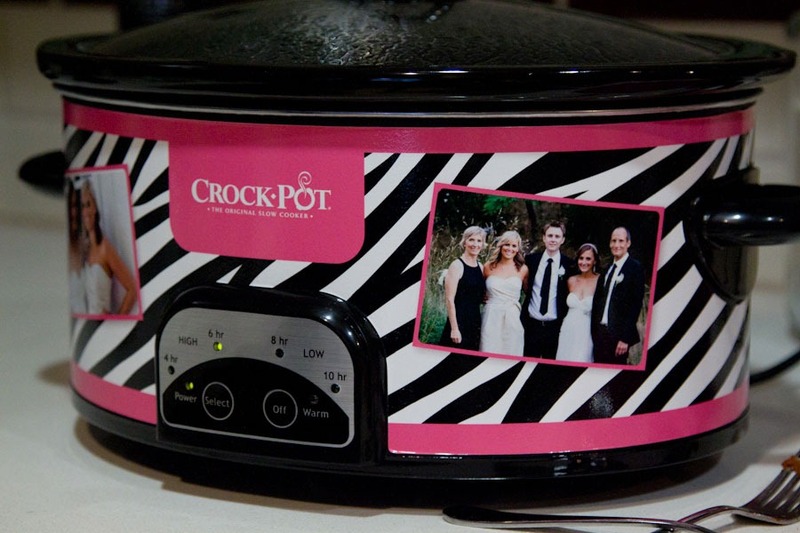 Do you like to cook with crock-pots? What do you think of the pink options? I am in love! I sure have eaten my fair share of m&m’s this week…yikes! 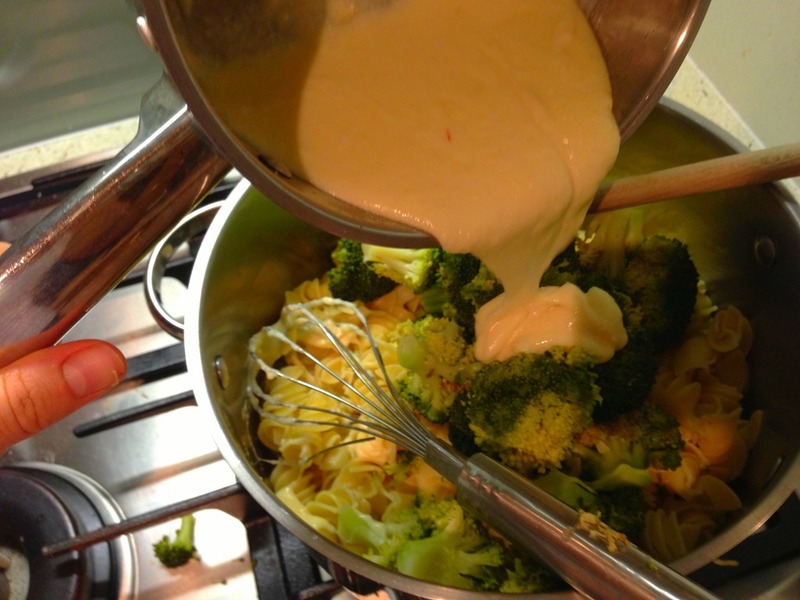 Although I know I could happily survive living off of Easter candy, I have been eating and cooking other things to balance all of that chocolate out, and lightened-up fettuccine alfredo with broccoli is one of them. You might be thinking: light fettuccine? Not possible. Guess what? Possible! 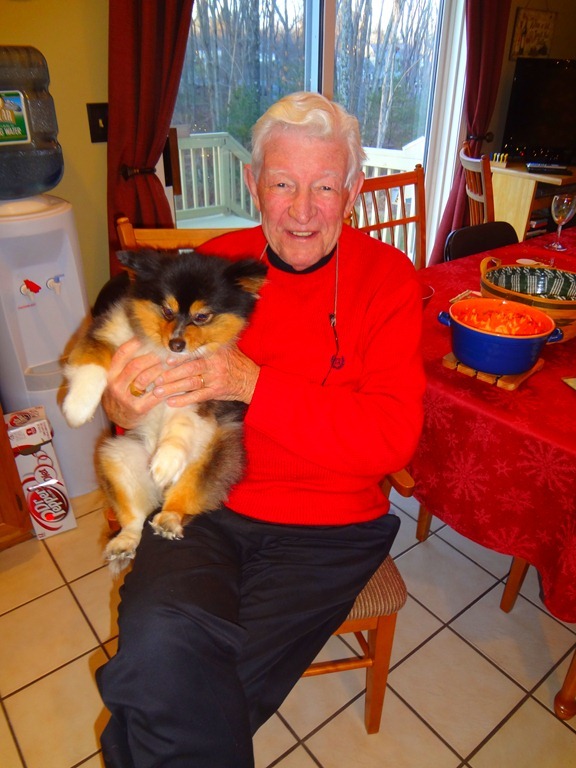 Thanks to my unbelievable Mom, this recipe has been in our family for years now. I’ve been eating this for as long as I can remember, and it seems to get better every time. Its creamy consistency and rich flavor might make you think this dish is indulgent, but it’s truly light in both fat and calories, which is a win-win in my opinion. The best part is that you can customize this dish any way you like. 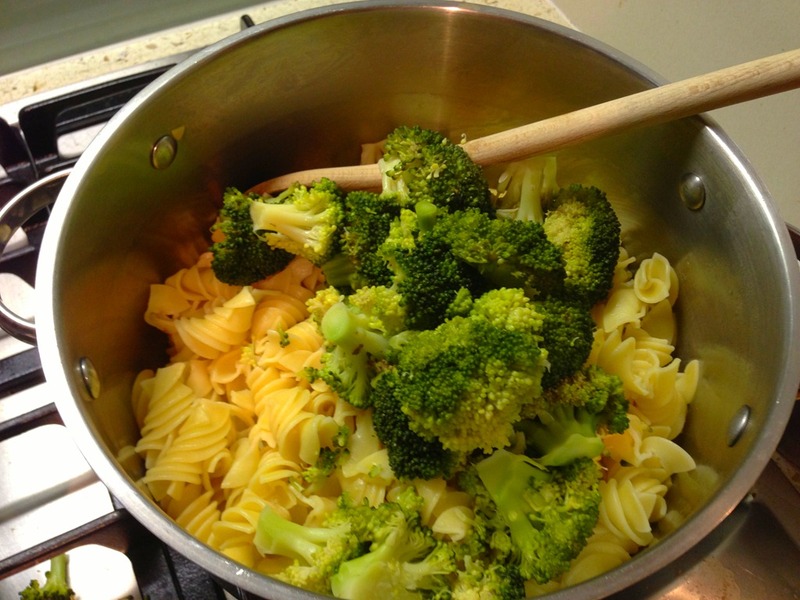 I prefer broccoli in my pasta dishes, so that’s what I added to the pasta base. However, if you prefer cauliflower, peppers, peas, corn, zucchinis, or another vegetable, just steam them up and throw them in. It’s your pick! 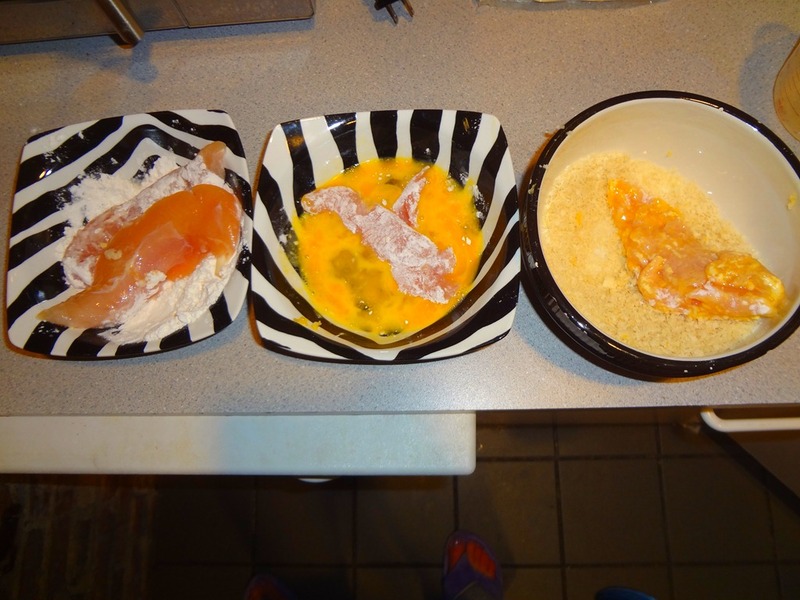 For an additional punch of protein, I breaded and baked chicken breasts and then sliced the chicken on top of each portion. This is totally optional, but it added some additional staying power to the dish. Brandon ate the leftovers 3 days in a row…looks like a winner to me! 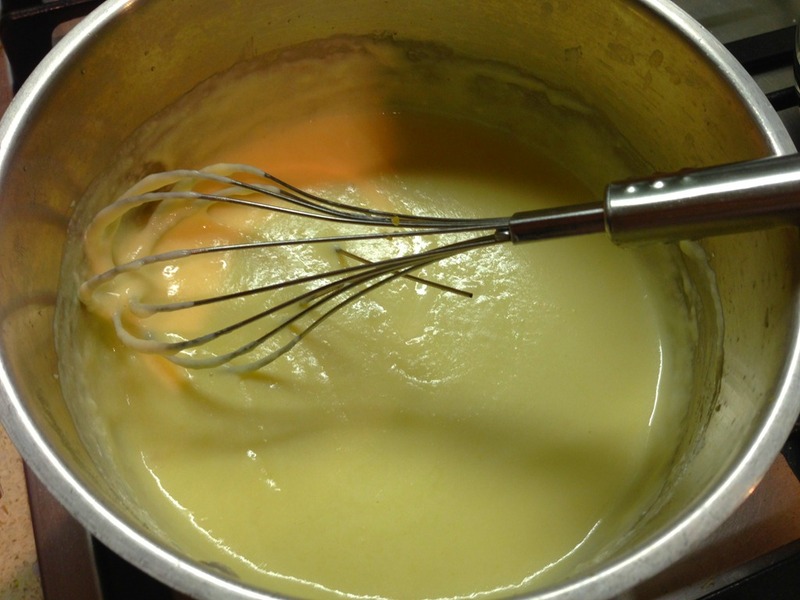 1 1/3 cup skim milk ( you may need more, but add gradually). 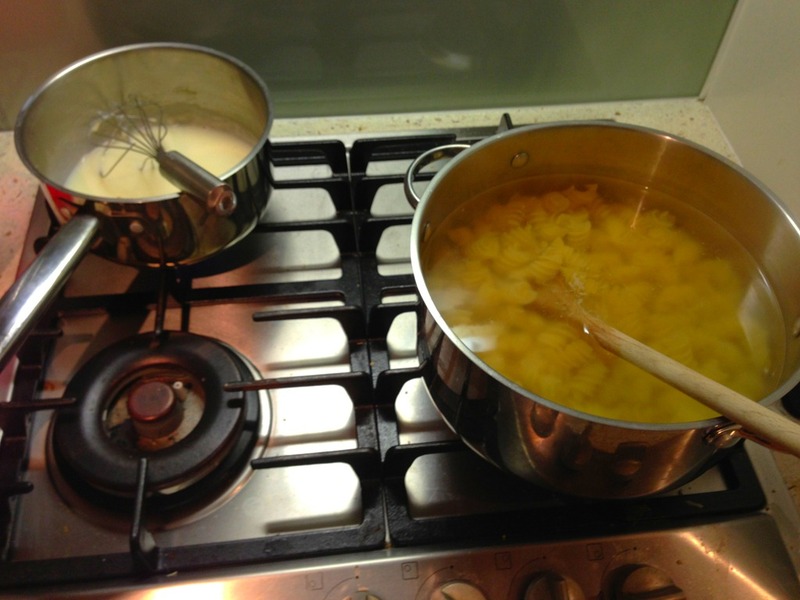 1) Boil your water for the pasta in a large saucepan. If adding a vegetable, chop it up and steam, then set aside. Once the water is boiling, add pasta. 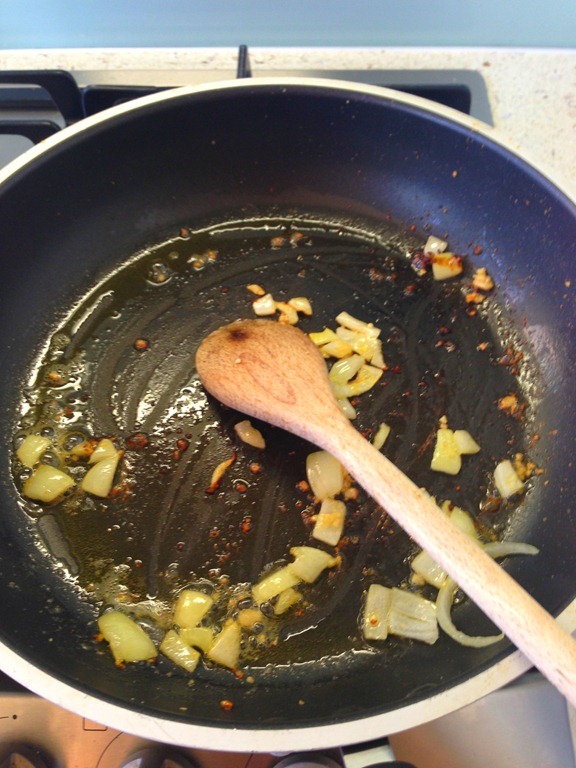 2) Next in a medium saucepan, melt the margarine, then add the garlic and sauté for one minute. 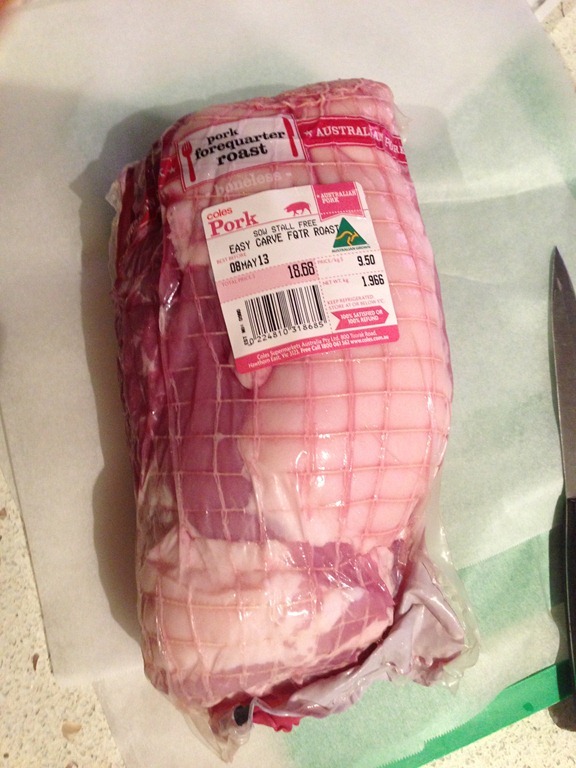 4) Cook this for 8 minutes, or until thick. 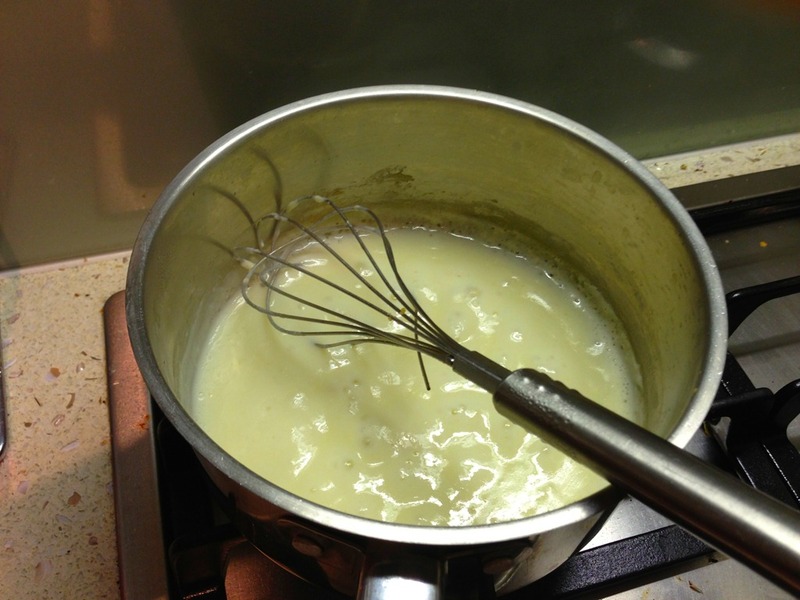 5) Stir in cream cheese, and cook for 2 minutes. 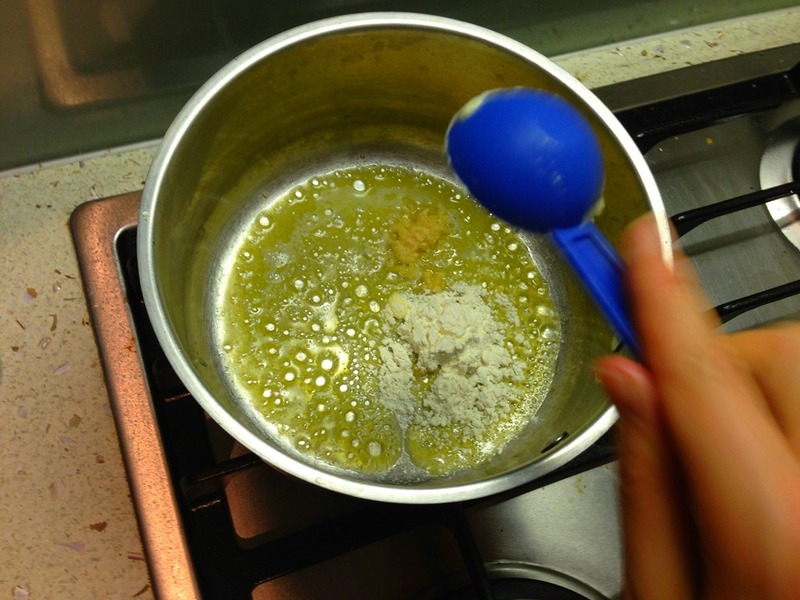 6) Add 1 cup parmesan cheese, and stir it until melted and smooth. 7) Once your pasta is cooked and drained, place it back into the large saucepan and pour the sauce over the hot pasta, tossing well to coat. Add your vegetable(s) to the mixture and stir. 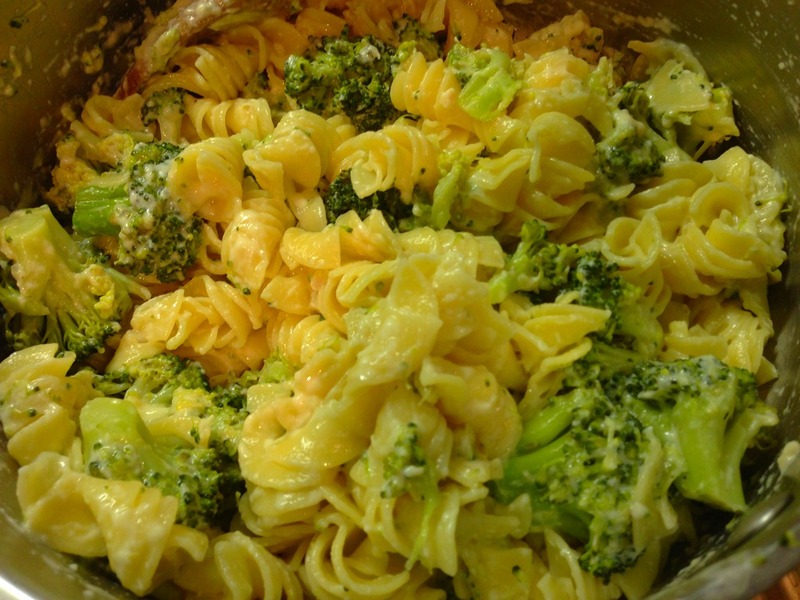 Portion into bowls or dinner plates, and top with remaining ¼ cup parmesan cheese. 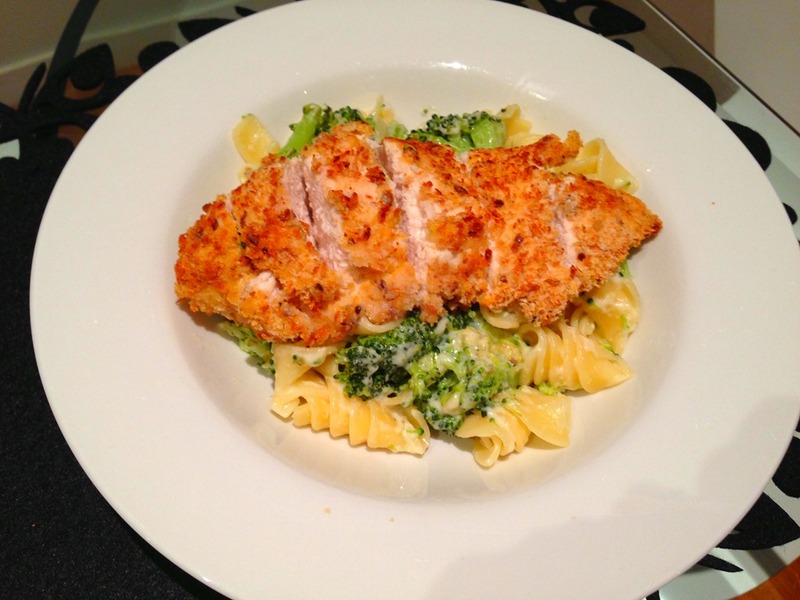 8) Lastly, if using chicken, slice and add it to each portion. This is one of those meals that made me want to keep eating, and eating, and eating. I forced myself to put the leftovers in a container and close the fridge after my second helping…it’s that good! Do you have a favorite “lightened-up” pasta dish? Hey there! How was everyone’s start of the week? Mine was nice and busy, starting with a 5:30 a.m. boot-camp, followed by a day full of classes until 6 p.m. Needless to say, it was a long day, but still a good day. Sometimes after long days, I want to go straight to bed. However, being in the kitchen is truly one of my favorite parts of every day, and last night was no exception. As tired as I was, I could not wait to make dinner; it was all I could think about! Honestly, I have been craving a good salad for months. It might sound funny, but salads as a “meal” are so popular in the U.S.A. and offered nearly everywhere, whereas restaurants around us in Australia don’t seem to offer many salads on their menus, if any at all. So a few weeks ago when I stumbled upon a certain salad recipe at one of my favorite blogs, Iowa Girl Eats, I bookmarked it immediately. I knew I had to make it, or at least attempt a similar version. I’m only cooking for one this week since Brandon is gone for work, so I cut down the quantity of her original recipe, and I adapted the ingredients to fit what I had available. 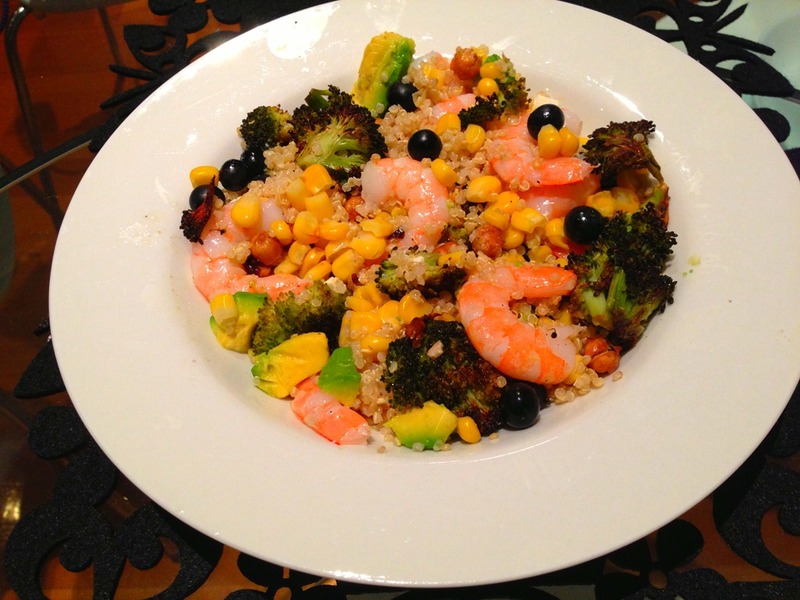 This salad incorporates cooked shrimp for protein, quinoa tossed with feta cheese as the salad base(another excellent protein source), and additional mix-in’s of corn, avocado, roasted broccoli and roasted chickpeas, and blueberries for a pop of color. All of this is drizzled in a lemon and olive oil based dressing to top off the salad. I loved every bite of this! It is filling, but very light. A perfect salad for the start of spring! 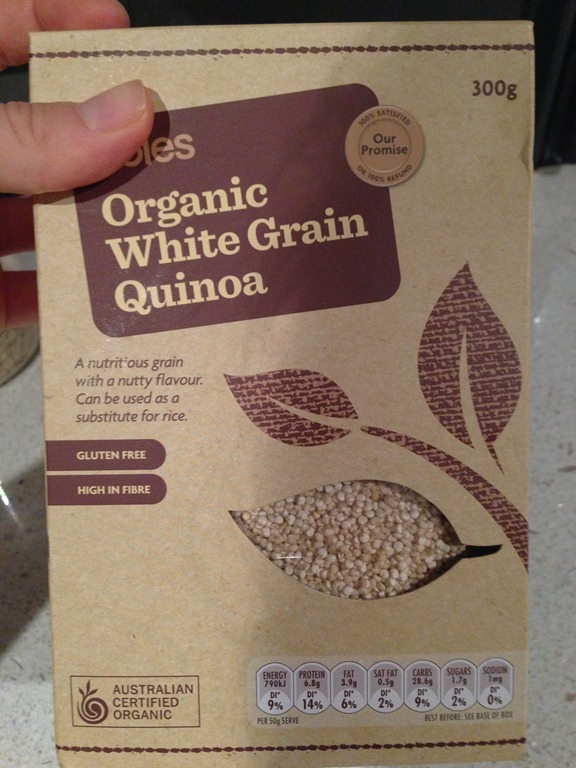 1) Cook 1/2 cup quinoa, following the package directions. I cooked mine in 1 cup of boiling water, and simmered it for about 15 minutes, until it was fluffy. 2) While the quinoa is cooking, prepare your salad ingredients. First, I set my shrimp on ice in the fridge to make sure they were nice and cold for the salad. 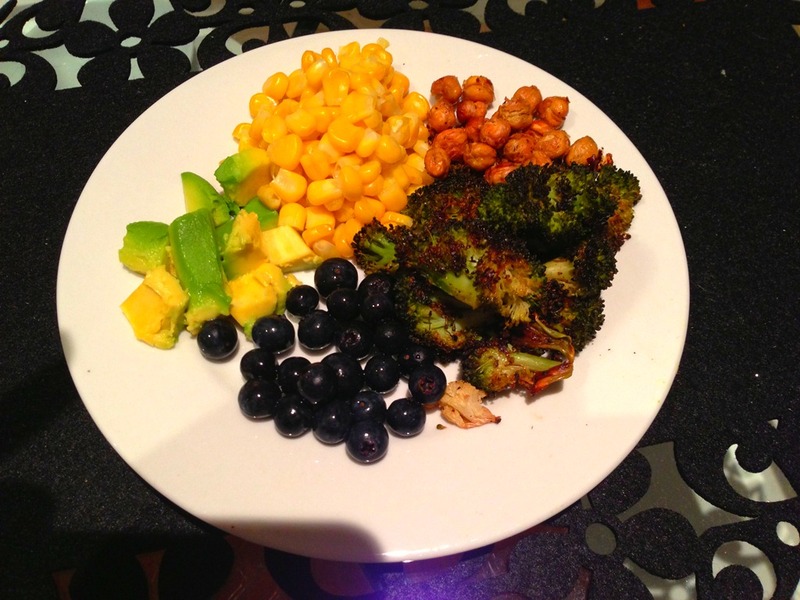 Then, I chopped the avocado, cooked the frozen corn for about 1.5 minutes in the microwave, and got my other ingredients out of the fridge, including roasted broccoli, chickpeas, and blueberries. 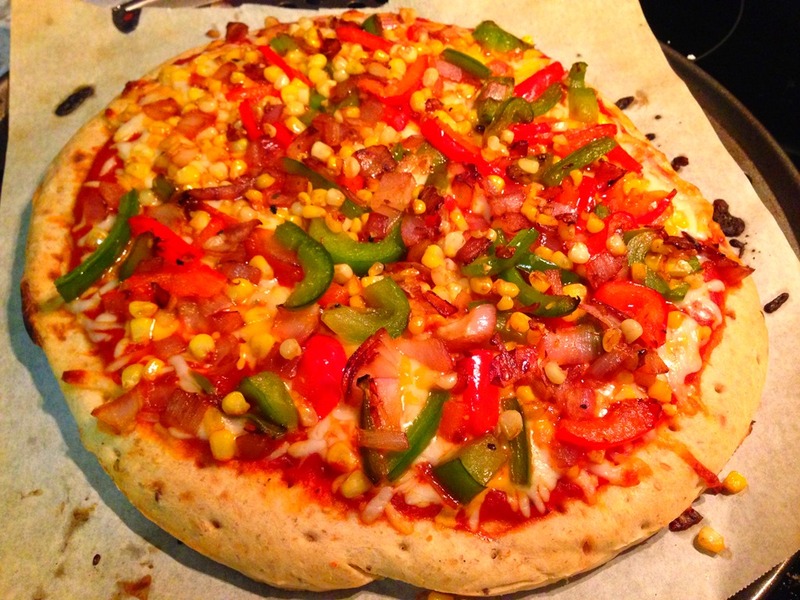 ***Keep in mind, you could add virtually any fruit or vegetable to this. I added what I already had in the fridge, so it was even simpler to make. Set these ingredients aside. 3) Now make your dressing by combining the lemon juice, olive oil, garlic and salt & pepper, and whisking them together in a small bowl until combined. 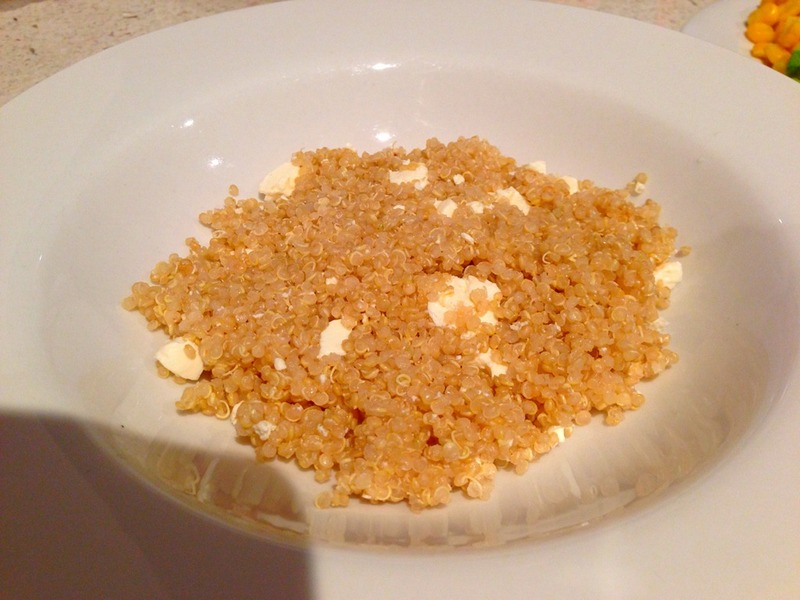 4) Once your quinoa is cooked, add the feta cheese(or your cheese of choice) and stir. Then prepare your salad. I started with the quinoa as my base, then added in the toppings, and finally the shrimp. Drizzle with the lemon dressing, and you’re all set! 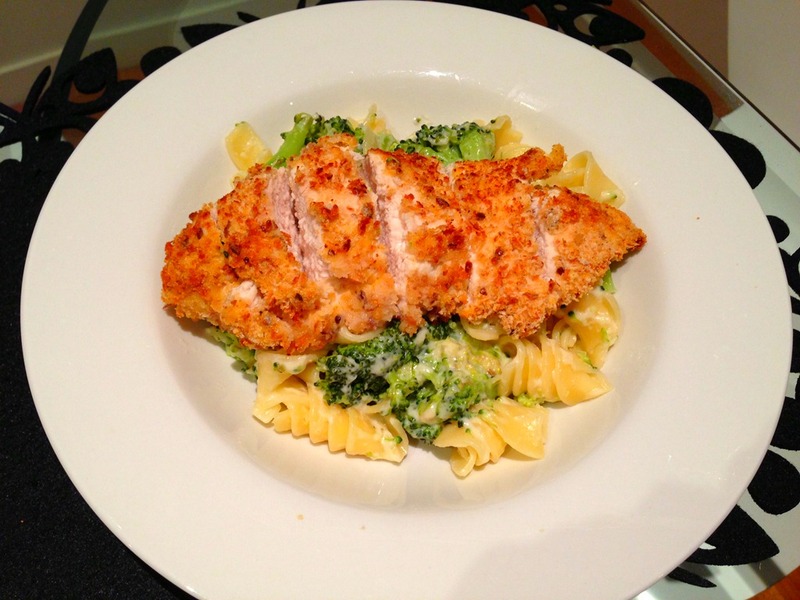 I enjoyed this so much, I’m seriously debating making this again for dinner tonight. The sweet lemon dressing paired with the textures and flavors of the fruit and vegetables, along with the fluffy quinoa, was a perfect meal to round out a long day. I have leftover quinoa, so it just may happen again tonight! What are your favorite salad ingredients? Happy weekend, all! Gosh, where does the time go? I for one was thrilled for Friday to come around. Not only did I finish my first week of classes, but I also completed my two massive final projects for my health professionals research class. I can not even explain how excited I was to pass those in. In my four years at Bryant U., I don’t ever remember having such time consuming projects! 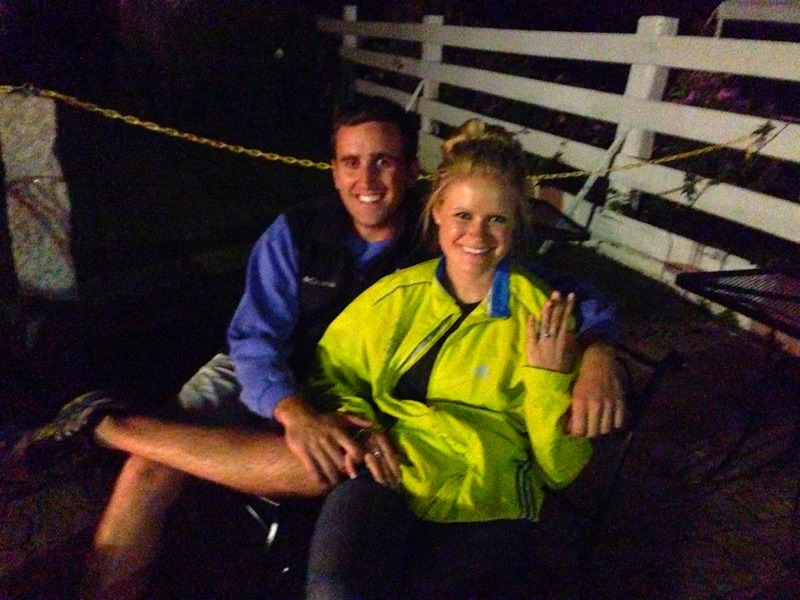 I celebrated with a glass of well-deserved wine and a homemade pizza. It was just what I wanted! Know what else is perfect? Homemade risotto. Last Sunday, Brandon mentioned he had a craving for a cheesy risotto. Cheesy risotto? Yes please, he didn’t have to tell me twice! However, I prefer risotto with something other than just cheese, so we added vegetables, a source of protein, and cheese into our Sunday night risotto recipe. For vegetables, we included broccoli, mushrooms and onion; for protein, grilled chicken; and for the star-of-the-show, parmesan cheese. 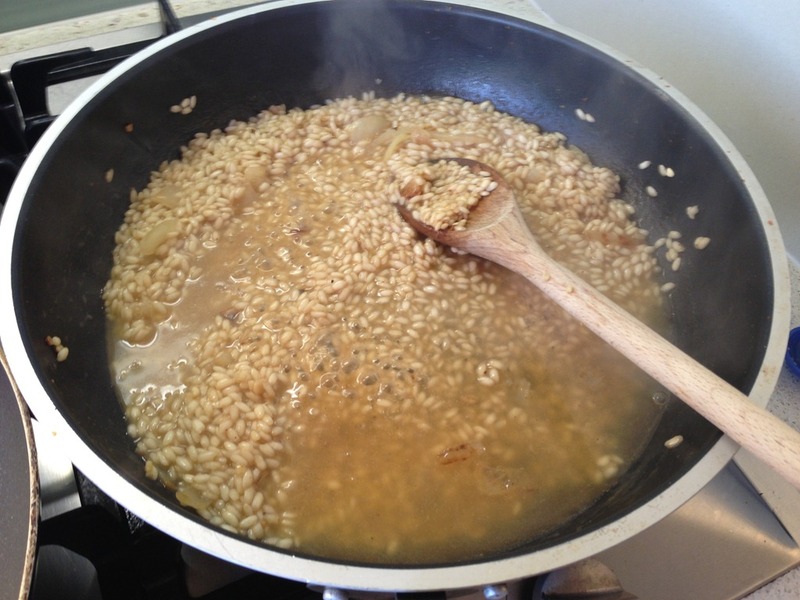 I think the key to any creamy risotto is to be consistent with stirring, so make sure when you make this that you have the time to stay by the stove and stir, stir, stir! Trust me, it may seem tedious to stand over the stove for 20-25 minutes and stir, but it’s truly worth it once you take your first bite! I adapted my all-time favorite Cooking Light Risotto recipe to include our ingredients of choice, and it turned out just as we hoped. You’ll notice that this recipe only uses one cup of rice, but believe me, you will have leftovers, and leftovers of risotto=bliss! 1) In a large saucepan, bring chicken broth to a simmer, then keep warm over low heat. 2) While your broth is simmering, prepare your vegetables by washing and chopping the broccoli, mushrooms, and onion, and then set them aside for the time being. I steamed the broccoli in the microwave for 3-4 minutes and set it aside, so that step was complete! 3) Now in a separate skillet, melt your butter over medium heat. Add the onion and cook for 2 minutes. Add 1 tsp. garlic; cook 30 seconds, stirring constantly. 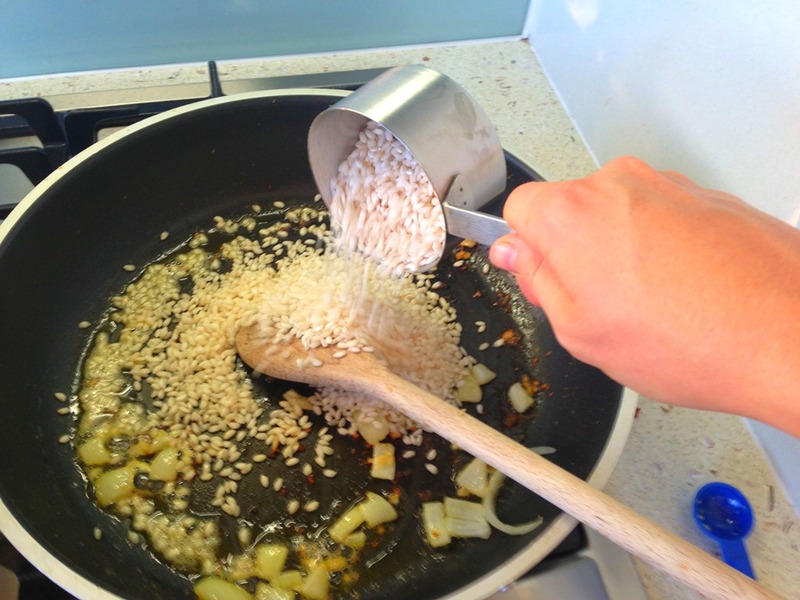 Now add the rice and cook for 1 minute, stirring constantly. 5) Now spray butter spray on a large skillet and place over medium heat. Add sliced mushrooms, and sauté until tender. Add the remaining garlic. 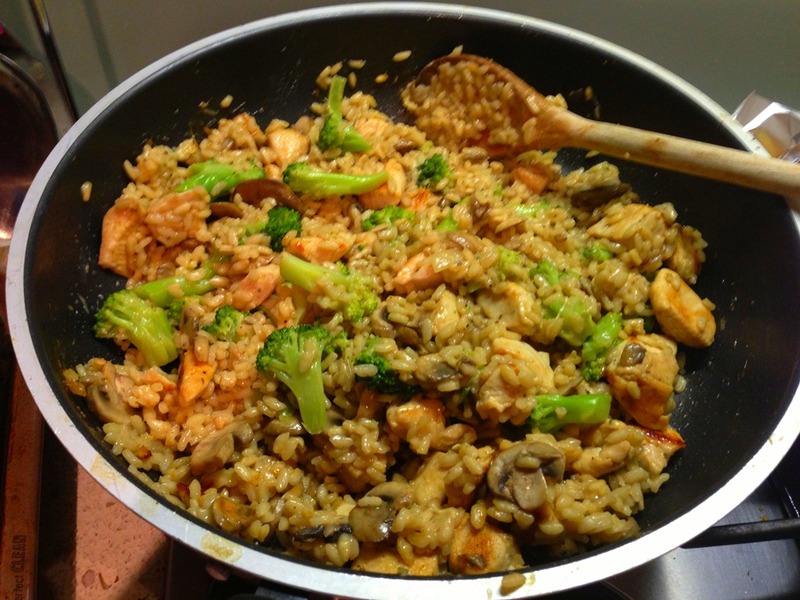 6)Lastly, stir the cooked mushrooms, broccoli, chicken, ¼ cup cheese, and pepper into risotto; cook for 3 minutes on low heat. 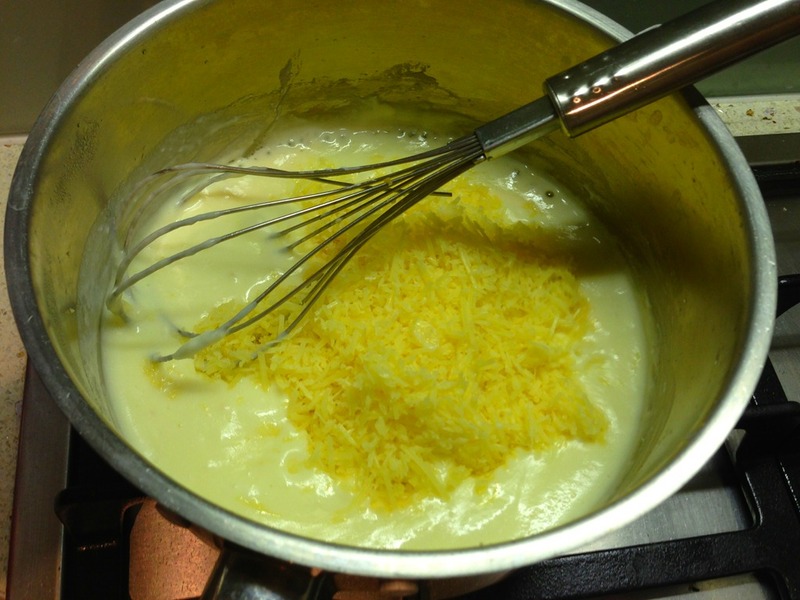 Serve, and sprinkle each serving with additional cheese if desired. Doesn’t it look yummy? 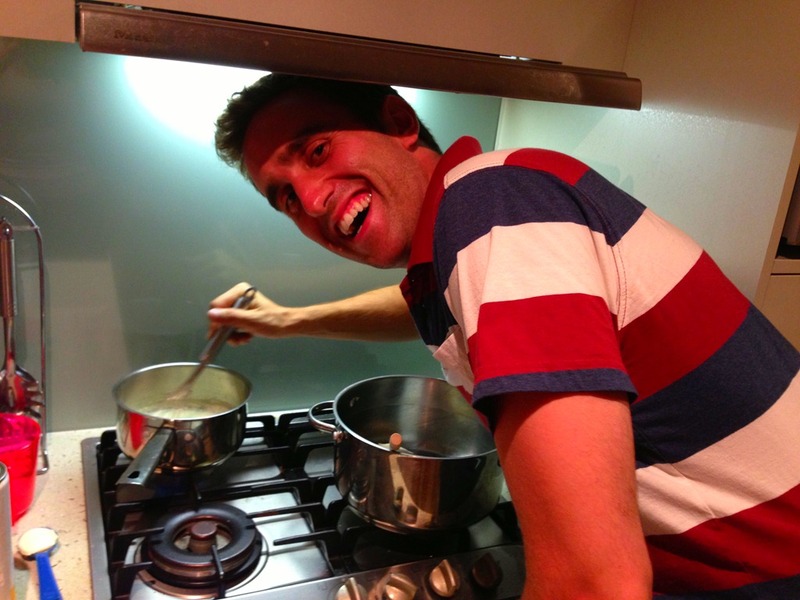 Brandon took the duty of cooking the chicken while I stirred the risotto, and I was grateful for the help! I do think it would be easiest to have your chicken cooked before you start the risotto, but it’s not a requirement. This dish is filling, yet healthy; just a little cheese goes a long way! Only 1/4 cup in the entire batch, and you can taste it in every bite. We ate ours with a side salad, and it was the perfect Sunday meal. 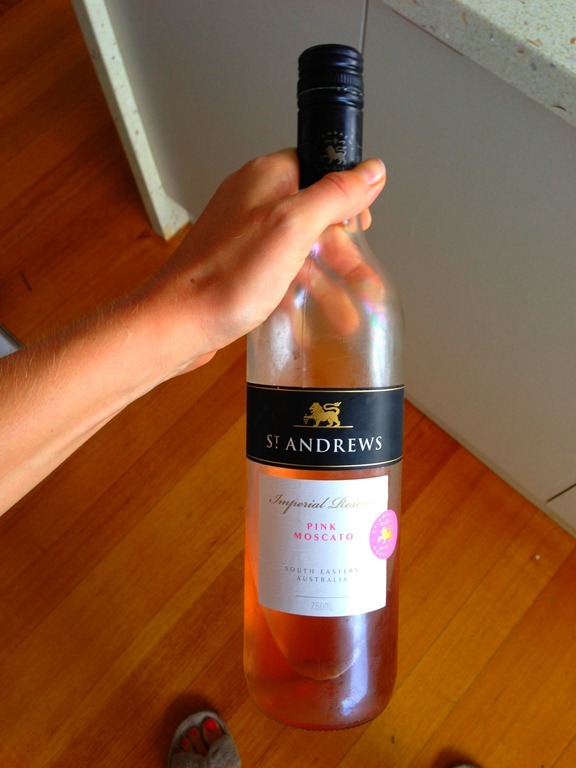 Hope you try this tonight! 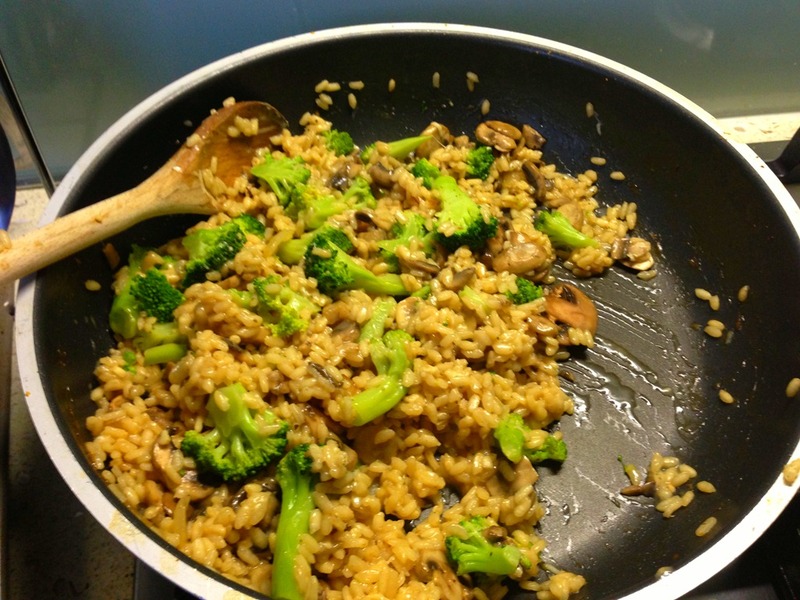 Do you like risotto? 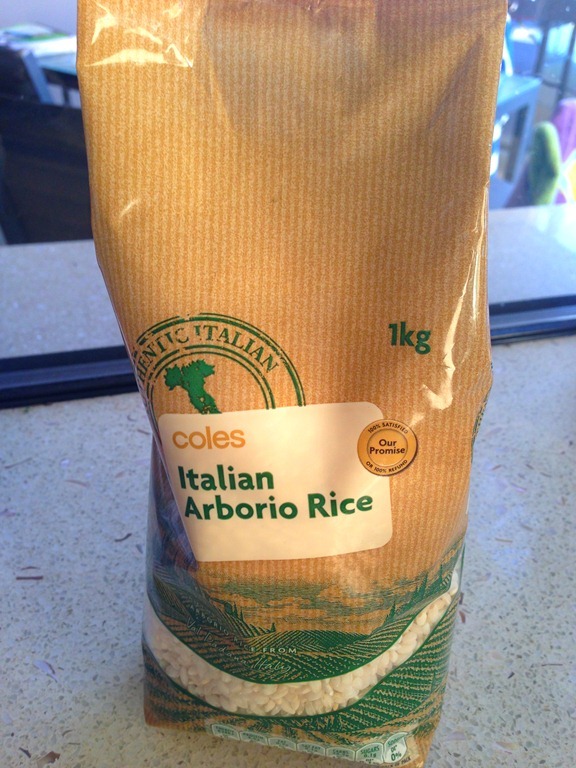 If so, what are your favorite risotto ingredients? Hi, I'm Meredith. Welcome to my blog. I strive to maintain a lifestyle that involves healthy eats, sweet treats, and fun with fitness, family, and friends.Thanks for reading! Follow me to be notified of new posts!